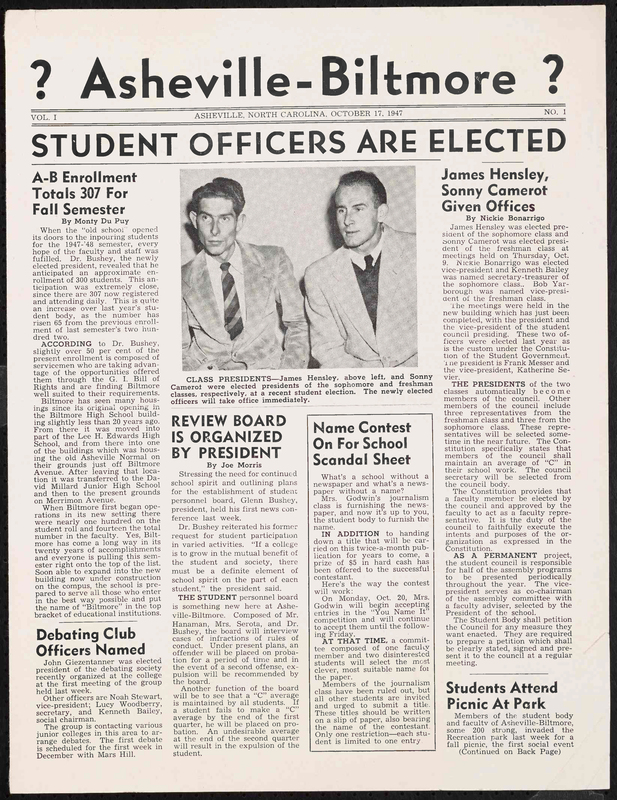 It is not known exactly when the first student newspaper was published by the predecessors of UNC Asheville. 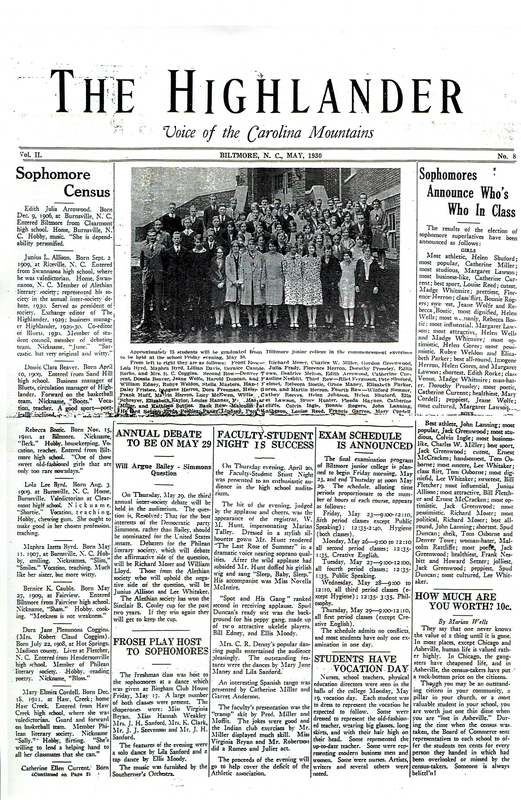 In his speech to the Class of 1929, Roy Taylor mentioned a school paper, so clearly publication started within two years of the creation of Buncombe County Junior College. “The Highlander”, May 1930. A photocopy is the earliest student newspaper in the University Archives. The earliest edition in the University Archives is a photocopy of the May 1930 edition of The Highlander, which was, “Published by the students of Buncombe County Junior College [and] founded by the Class of ’29.” This edition is identified as Vol. II No. 8, suggesting a monthly publication, with Vol 1 No. 1 appearing sometime during the 1928/29 academic year, which would align with Taylor’s remarks. 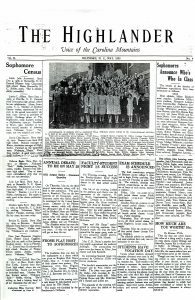 The first original newspaper in the Archives is The Highlander dated May 1935, which is confusingly identified as Vol. 1 No.2. Since, Vol.1 nos. 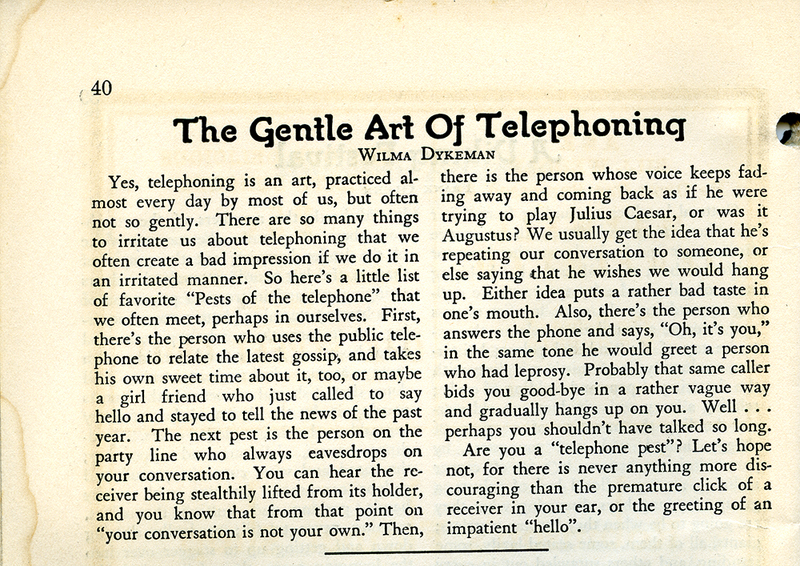 3 and 4 are also in the Archives, and are respectively dated March 1935, and April 1935, the paper still seems to be a monthly publication, but the reason for reverting to Vol. 1, or even if a paper was published between 1930 and 1935, is not known. The Archives have a further editions of The Highlander through to May 21, 1938, and from the volume and issue numbers, it seems likely the paper was published sporadically. These editions reveal the paper contained college news, letters to the editor, gossip, poems, and advertisements from local businesses. 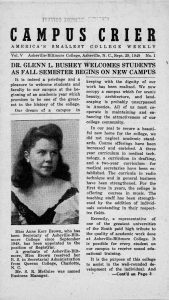 There is no record who won the naming contest, but the newspaper was called The Campus Crier by November 1, 1947 when Vol. 1 No.2 was issued. The Campus Crier continued through to the 1960s. The last edition in the Archives is Volume XV-R1 Number 2, dated November 1961, with the volume numbers suggesting the paper had been published regularly since 1947. 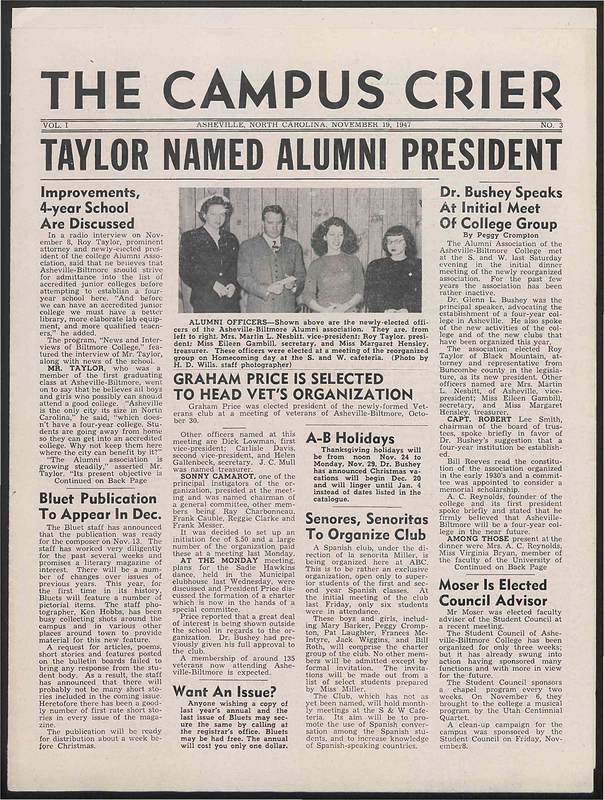 Although in 1961 The Campus Crier was still being published by journalism students, it had seen numerous changes since 1947. These included both the size and quality of the paper, the number of pages, and the inclusion, or not, of photographs, perhaps all a reflection of the college’s financial wellbeing at any given time. Throughout its run however, The Campus Crier was still internally focused with college news, editorials, and letters, supplemented by the local business advertisements. Chronologically, the next newspaper in the Archives is Vol. 1 No.1 of The Ridgerunner, dated September 27, 1965. Again, it is unclear if this four year gap is due to missing copies, or because no paper was published. 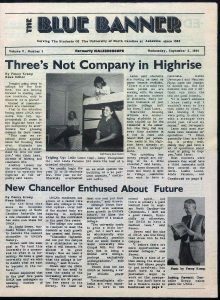 Unlike The Campus Crier, The Ridgerunner was published by the student union, but initially it still followed the same college focused editorial style of its predecessor. However, the content soon expanded to include local and national news, record and movie reviews, and political commentary. The last Ridgerunner in the Archives is dated February 2, 1979. Again it is unclear is this was the last issue or just the last one archived, but on February 28, 1979, Vol. 1 No. 1 of The Rag & Bone Shop was published. This was much more of a literary paper than a newspaper, with early issues having an address c/o The Ridgerunner, as though, initially at least, it was meant to supplement, rather than replace, The Ridgerunner. By the fall of 1979, the content had become news than literary but, by 1982, it changed once again, becoming much more a glossy literary journal that was published monthly. In addition to being unsure of its content, the publication also seemed unsure of its name, with “Shop” disappearing from, and then returning to, the title. The Rag & Bone Shop ended in controversy. The April 1982 edition featured a drawing of a crucified Easter bunny on the front cover, leading to protests, including the burning and confiscation of the offending issue. 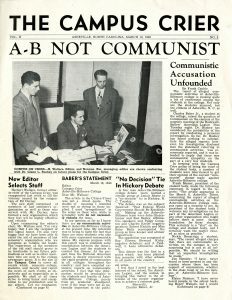 The magazine staff claimed first amendment rights, and produced a further edition in May 1982, but with no one willing to be the next editor, The Rag and Bone Shop ceased publication. 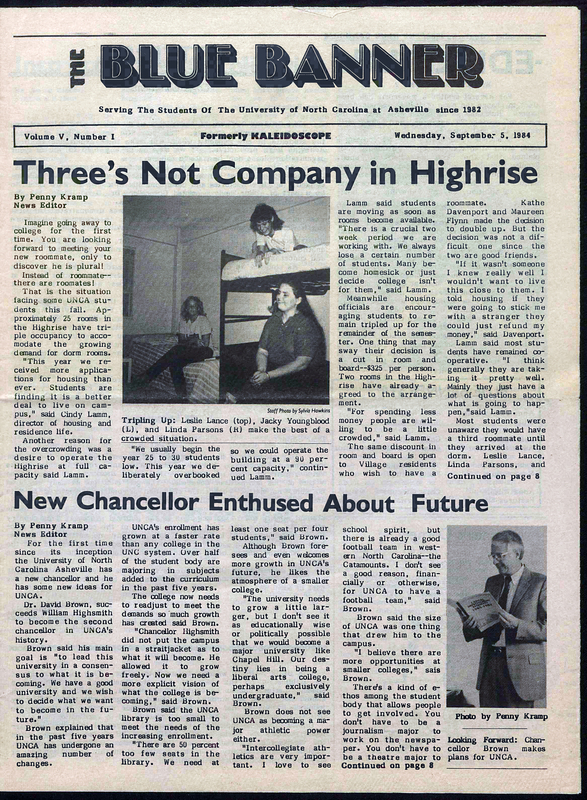 It was replaced by Kaleidoscope, which was first published on September 9, 1982, and marked a return to the weekly news format of The Ridgerunner. 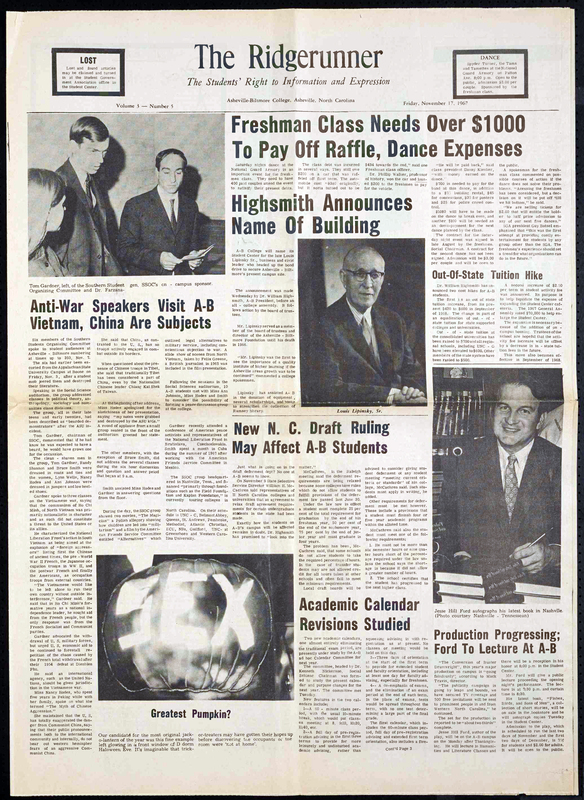 The focus was still campus news and events, supplemented by entertainment reviews and classified advertisements. 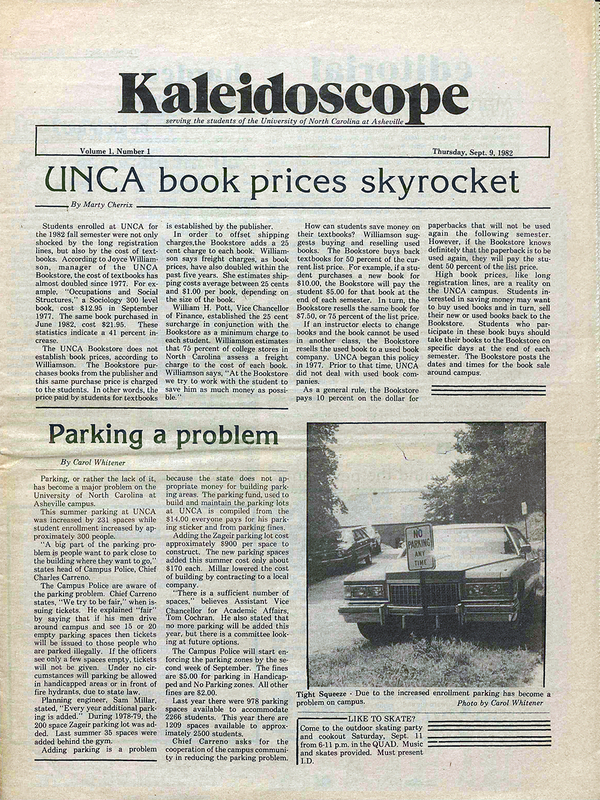 The editorial in the first issue explained the name “Kaleidoscope was chosen because it implies something that is constantly changing and showing many different views.” Production of the newspaper was open to any student who wished to participate and it was funded through student fees paid with tuition. The final Kaleidoscope was Volume IV, Number XIV, dated April 1984. By then, non-campus news formed about half of the items, and there was much greater use of photographs. The newspaper gave several reasons for the name change. Students said kaleidoscope was “hard to spell,” faculty thought the name “artsy…unprofessional,” administrators wanted a name “that better reflected the campus,” and several Asheville businesses were called Kaleidoscope. But why The Blue Banner? 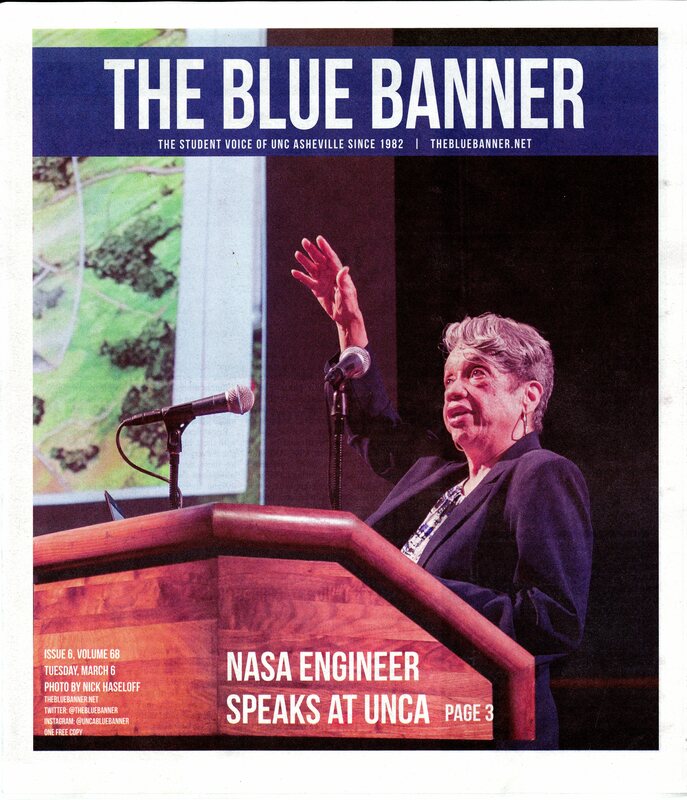 Irrespective of the reason for the name, it still continues, making The Blue Banner the longest lasting running title of all student newspapers at UNC Asheville and its predecessors. However, the name is about the only constant at the newspaper over the last thirty-four years. Page sizes and layouts have changed, and changed back, color images and type have replaced black and white, the paper is published online as well as print, and social issues have a much higher profile than they did in the 1980s. 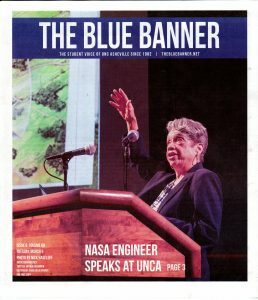 Throughout its existence, the quality of journalism featured in The Blue Banner has been frequently recognized and praised. The most recent example being in February 2017, when the newspaper earned six awards at the N.C. College Media Association’s conference. The above is a brief summary of “official” student newspapers. 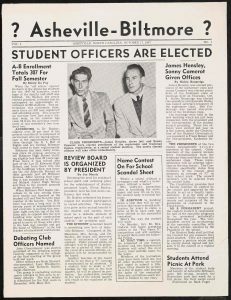 “Unofficial” publications have included The Scholastic Screamer and the UNC-A Free Press, whilst publications such as The Paper and Bulldog Barker were published by university administration rather than the student body. Formed in 1927 as a two year college, Buncombe County Junior College only had one class graduate during the roaring twenties. 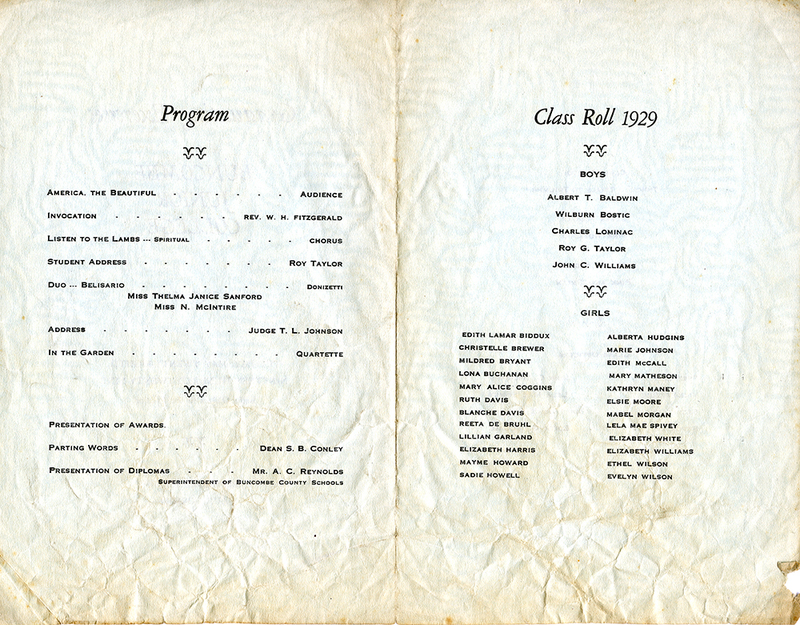 Very little archival evidence of that first graduating class of 1929 exists, the most notable document being program from that first commencement. The program lists 29 graduates, with the majority of these being women. 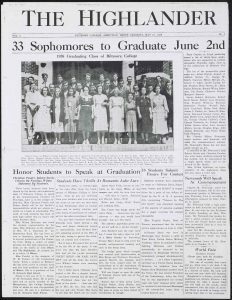 However, the person chosen to be the speaker for the class of 1929 was Roy Taylor, one of the few men graduating that day. Talking with Chancellor William Highsmith in 1984, Taylor thought that being part of the college debate team led to his selection. “Two years ago we gathered here as the first class of Buncombe County Junior College, an institution organized and supported by the citizens of Buncombe County who saw the need for furthering the process of home education. The county, which was already in debt, was unable to support us with the modern college needs. They secured the necessary faculty members, they obtained rough rooms on the first floor of this high school building, and they left the rest to us. Nothing was provided for athletic equipment or a coach, and we wanted both. We were determined to have a football team, a team that we were not ashamed of. We had our team, but to do it we had to go in debt $1000 during the first month of the life of our college. We wanted a school paper, and we went in debt to get it. Taylor described how students sold season tickets, charged admission to games, had carnivals and pancake suppers, and accepted donations, enabling them to raise over $2000 in the two years that he was at Buncombe County Junior College. 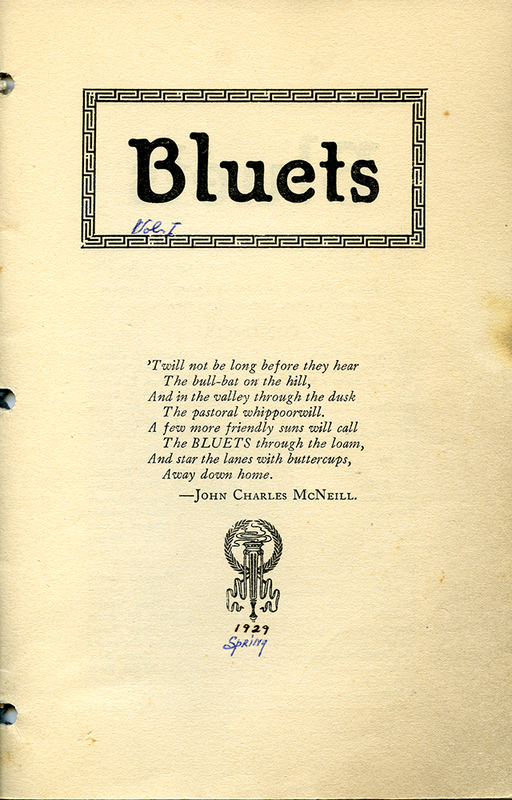 In turn, this meant that the college had winning football and girls’ basketball teams – although the boys’ basketball team was not so successful – a quality literary magazine called Bluets, a literary society, and a student council. In addition to lack of funds, the college faced other adversities. It was a very small college – only 85 students enrolled in 1927. So, although a football team formed in the fall of 1927, there were only 16 to 18 in the squad, meaning they couldn’t practice a scrimmage. Nonetheless, the $1000 debt Taylor referred in his class address does seem to have enabled the team to have a uniform. Taylor was not native to North Carolina, having been born in Vader, Washington on January 31, 1910. However, not long after his birth, the family moved to Buncombe County, and Taylor was educated in the county’s public schools. After Buncombe County Junior College, Taylor attended Maryville College in Tennessee. He told Highsmith that he always wanted to be a lawyer, but did think about training to be a teacher. However, whilst he was studying law at Asheville University Law School, he did teach at Black Mountain High School. After getting his J.D., he became a lawyer in private practice in Asheville. After serving in the US Navy from 1943-1946, Taylor entered politics, and was elected to the North Carolina General Assembly in 1947. 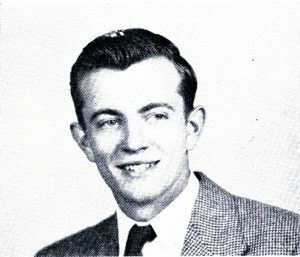 During his time in the state legislature, Taylor helped drive the initiative leading to the 1957 Community College Act. His old alma mater, now Asheville-Biltmore College, subsequently became the first community college in North Carolina, an event that he told Highsmith was key to the college’s long term survival as it meant Asheville-Biltmore received state funding. In the spring of 1960, North Carolina Congressman David M. Hall died while in office, and Taylor was elected to take his place. Taylor served out the term as the 12th District Representative, and was elected for eight Congresses after that as the 11th District Representative. 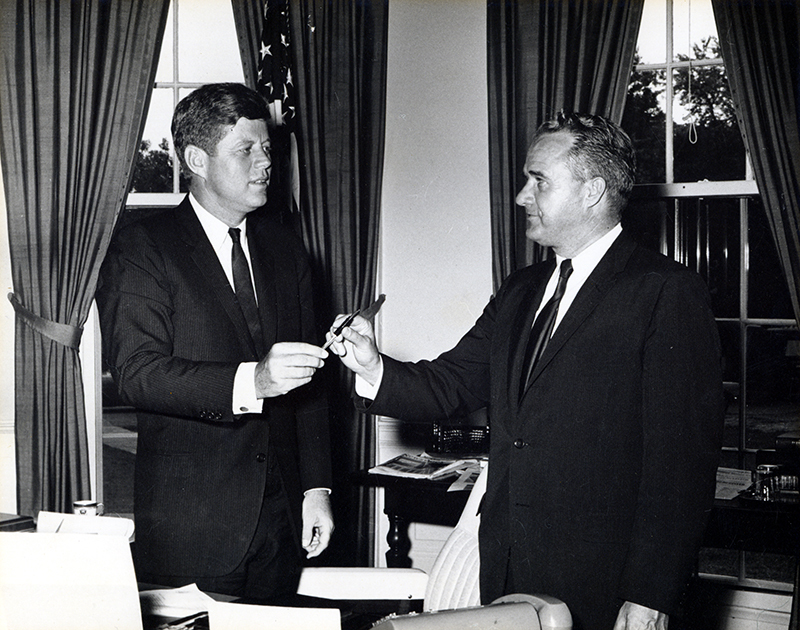 In total, he was in the House of Representatives from June 25, 1960 until January 3, 1977, and he served on the Interior and Insular Affairs Committee, and was chairman of the National Parks and Recreation Subcommittee. In recognition of his contribution to interior affairs, part of the Nantahala National Forest in Jackson County is named for Roy A. Taylor. Despite his involvement in national politics, Taylor still had time for his former college. 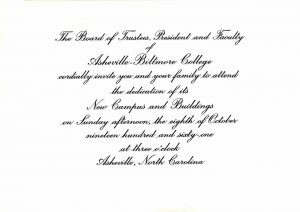 In 1947, he had been named president of the alumni association, and in 1966 was part of the alumni association reorganization committee, ensuring the organization would meet the needs of a senior college, which Asheville-Biltmore had recently become. 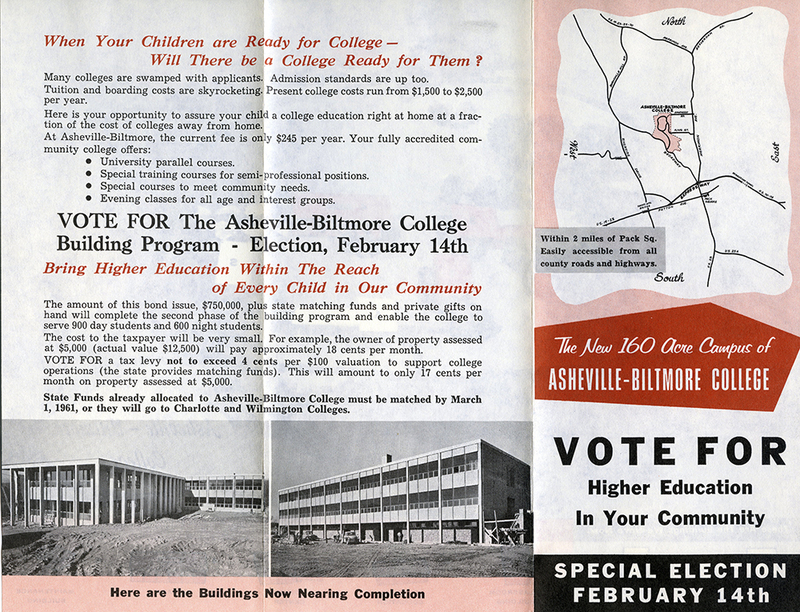 The Community College Act necessitated a change in how Asheville-Biltmore was governed. A new board of trustees was created in 1958, and Taylor was elected vice-chairman. Later that year, he was one of the first board members to view a proposed new site for the college in north Asheville, and was thus a key figure in UNC Asheville being located on its current campus. After he retired from Congress, Taylor started sponsorship for a public speaking contest at the UNC Asheville, and the income from the grant he donated is used for the Roy A. Taylor Public Speaking Contest, offering cash prizes to students. In 1986, the UNC Asheville recognized Taylor’s contribution to the university when he was one of the first three people to be presented with an honorary degree. As further recognition of Taylor’s service, each year the university presents the Roy A. Taylor Distinguished Alumnus or Alumna Award, UNC Asheville’s highest alumni award. Roy Taylor died on March 2, 1995. At 9pm on February 2, 2007 a choral group sang in the Highsmith Union Building, as two people worked ropes to lower a tarp. 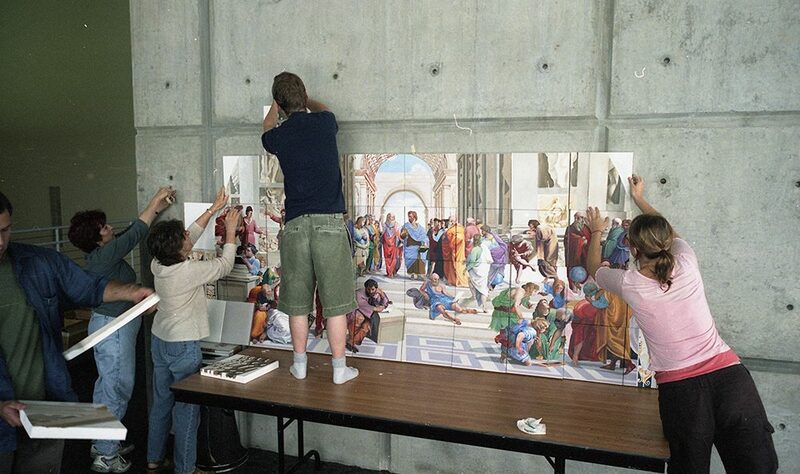 The tarp was covering “The School of Athens,” a mural that was the result of two years’ work by students, faculty, and community members, operating under the direction of UNC Asheville Professor of Art, S. Tucker Cooke. The mural was a full scale reproduction of the 16th century Vatican fresco by Raphael. Rapid River Art Magazine (November 2005) reported that when Cooke was asked for ideas for artwork for the expanded Highsmith building, (see our last blog for more information), the School of Athens came to mind, “Because it is the quintessential painting about liberal arts.” The mural represents art, music, mathematics, astrology, philosophy, politics, and astronomy, and includes people such as Socrates, Plato, and Michelangelo. Cooke did however include some local color in his version, in the form of two UNC Asheville bulldogs sitting together in the lower left corner. 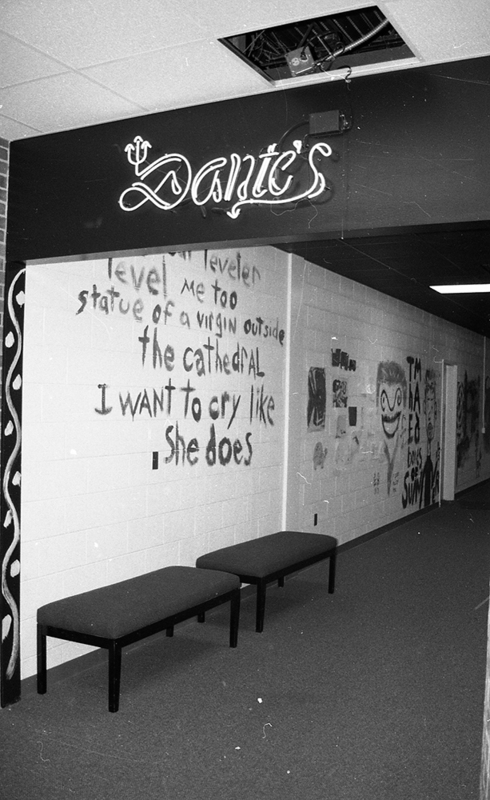 The mural was created in stages. Using books and drawings of the Vatican fresco, Cooke first photocopied and enlarged Raphael’s line drawings, and then divided these into eight inch squares, from which volunteers produced scale drawings in graphite. The scale drawings were then enlarged to ten inch squares from which volunteers produced brown, white and black paintings called grisailles. Next, the grisailles were used to paint colored twelve inch square in acrylic. A slide was made of each acrylic square, and the slide was then projected onto a four feet square canvas, so that outlines could be drawn from the projected image. Finally, these outlines were filled in using acrylic paint, and the canvases hung on the wall in sequence. 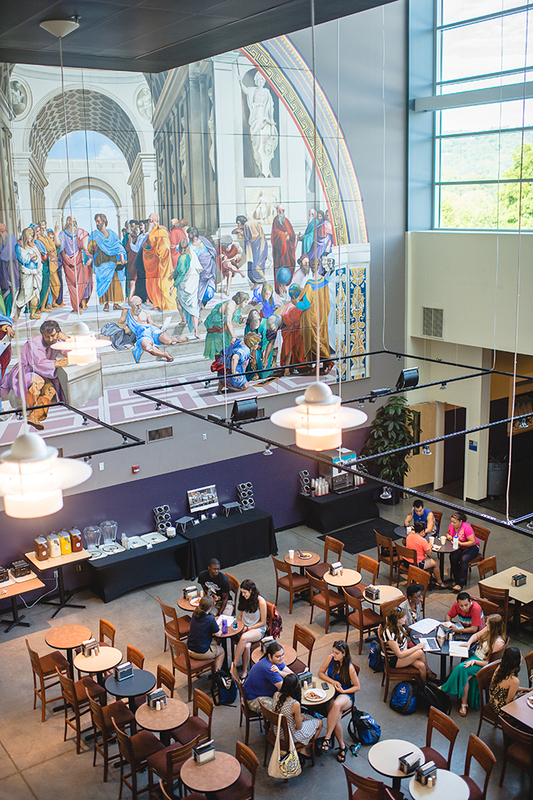 The completed mural soars almost 50 feet above the food court floor, and is thought to be one of the largest recreations of the School of Athens in the world. 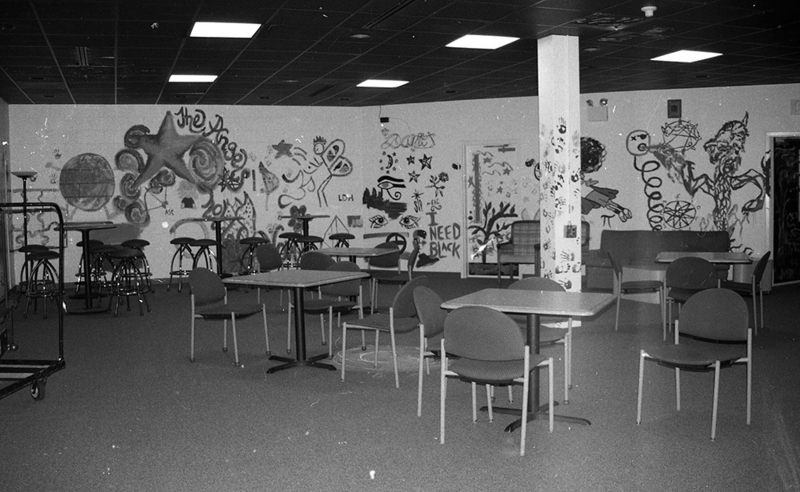 On the day the mural was unveiled, the gallery in Owen Hall was named in honor of Cooke, who retired from UNC Asheville in May 2007, after over 40 years at the university, serving as chair of the art department from 1971 until 2004. 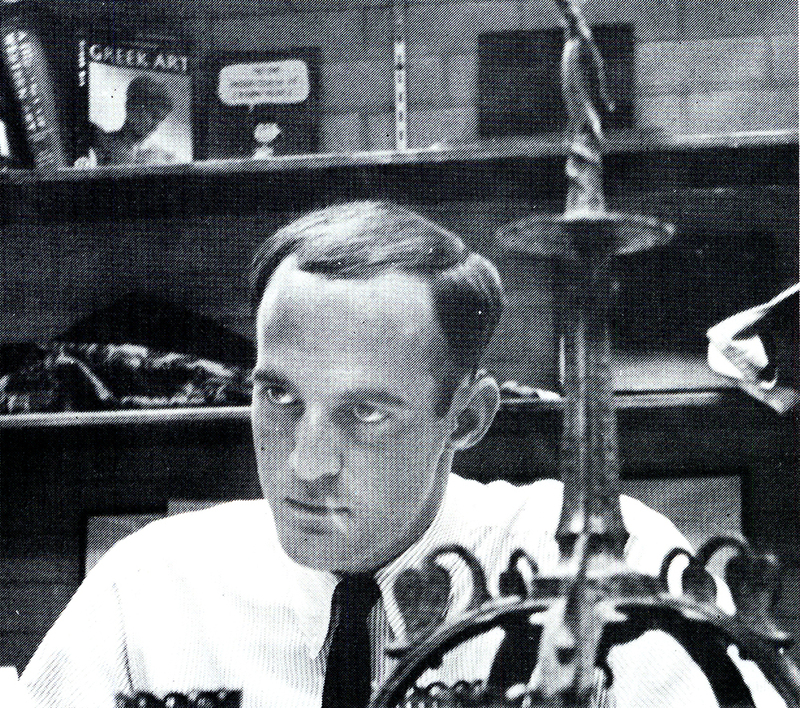 Cooke had come to Asheville-Biltmore College in the fall of 1966, as an instructor in art, immediately after graduating with a MFA from the University of Georgia. 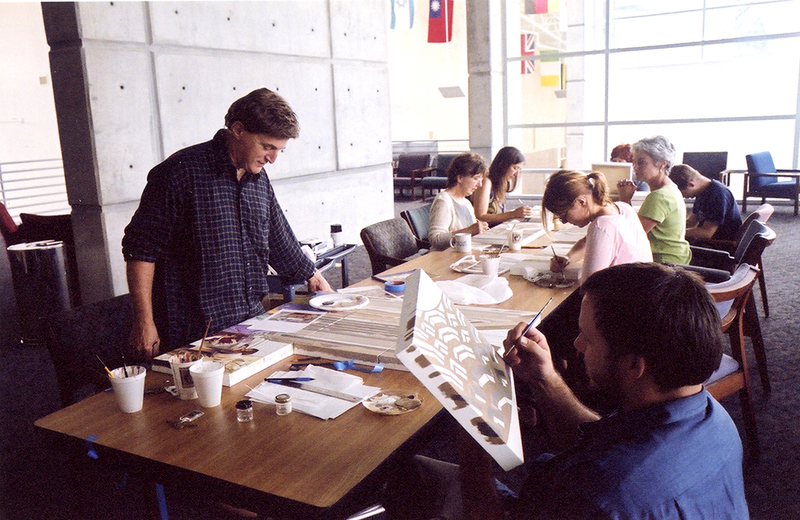 During his time at A-B College and UNC Asheville, Cooke was instrumental in expanding the art department in both size and reputation, and still found time to stage numerous one-man shows, take part in juried exhibitions, and contribute to civic art works. In 1995, he received a distinguished teaching award from the university, and co-designed a new Chancellor’s Medallion for the installation of Chancellor Patsy Reed. A number of Cooke’s works are part of the permanent exhibition at the Asheville Art Museum. As our last blog described, the Highsmith Student Union is currently undergoing further renovations. Fortunately, these will not impact the School of Athens mural. 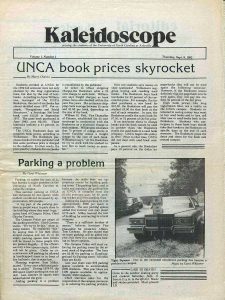 It is probably fortunate that UNC Asheville does not regularly feature in the pages of The Fire and Rescue Journal, published by the NC Department of Insurance, Office of the State Fire Marshall, but in the fall of 2002 the university made the front page. The reason was Operation Highsmith, described as “the State’s largest terrorism and structural collapse exercise,” which the Office of the State Fire Marshall had organized during May 20-24, 2002. For five days the campus’ Highsmith Center hosted 250 personnel from response teams from local, state and federal agencies across North Carolina, as they participated in, “mock drills and exercises involving simulations of hazardous materials leaks, bioterrorism events, terrorist attacks, and hostage and bomb scenarios.” Sections of the building were also demolished so that rescuers could practice working with heavy machinery. 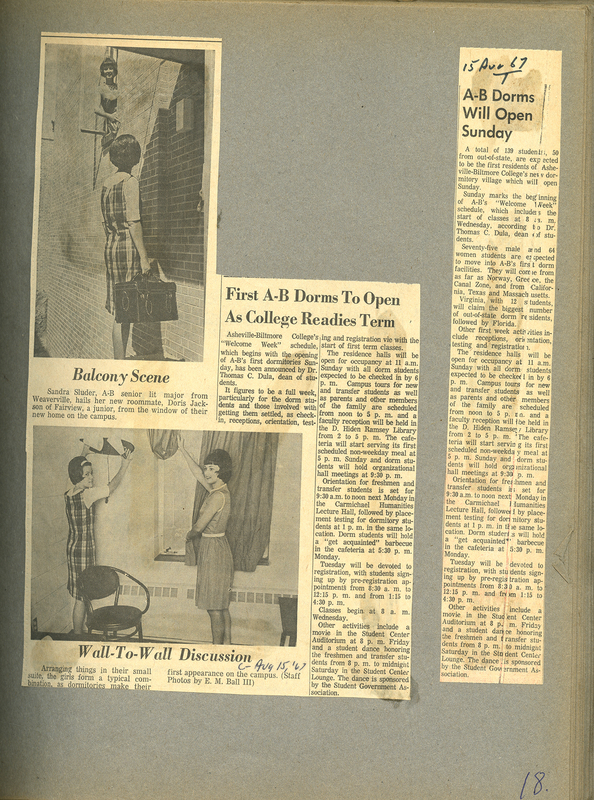 There are no photographs of the exercise in the University Archives, but The Fire and Rescue Journal described teams wrangling with “refrigerators, concrete jersey barriers, lumber and ropes,” and maneuvering “cranes, Bobcat tractors, saws and welding torches.” A rescue dog was even lowered into the building through a hole in the roof. Thankfully, neither the dog nor anyone else, seems to have been harmed during the exercise. 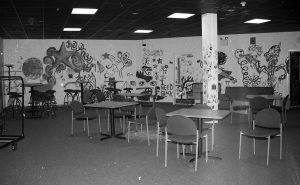 Students had left campus for the summer, and Highsmith’s occupants had been relocated to the Dining Hall. But, there seems to have been some spectators, as the Blue Banner reported a viewing area being provided for the media and general public to observe the exercises. 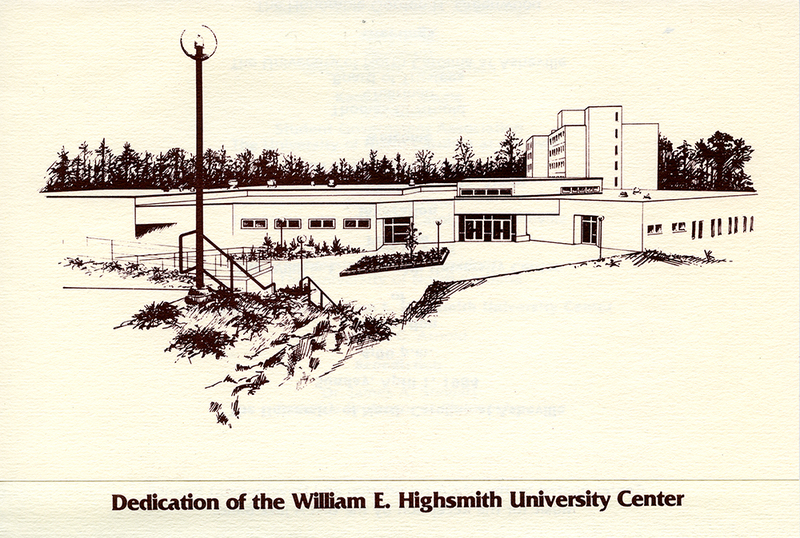 The William E. Highsmith University Center was dedicated on April 1, 1984. 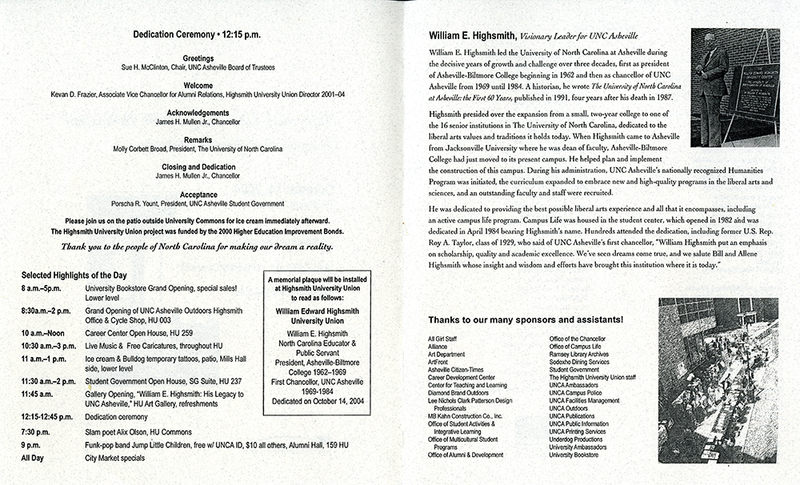 The Asheville Citizen reported how, “more than 400 people braved chilly spring winds” to honor Chancellor Highsmith, who was retiring at the end of June 1984, after a total of 22 years as Chancellor of UNC Asheville, and President of its predecessor, Asheville-Biltmore College. 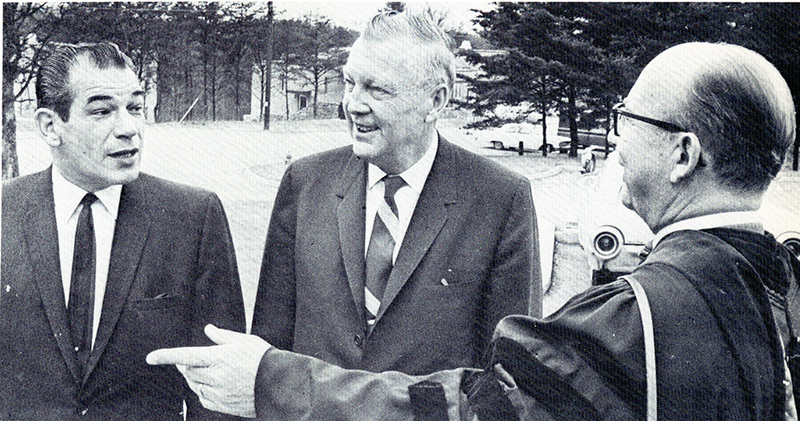 It was Highsmith who, in June 1980, had started construction on the project when he drove a bulldozer for the groundbreaking ceremony for the Center and adjacent Highrise dormitory building. In 1997, 950 students lived on campus, compared to 400 in 1982, and it was anticipated the number would grow to 1,100 by 1999. Total enrollment also grew, from 2,520 in 1982 to 3,170 in 1997, with student involvement in campus activities growing along with enrollment. Plans were drawn up to renovate the existing center, and add a further 46,000 square feet, to more than double the size of the building. It was not just a matter of space though, the condition of the building was also causing problems. 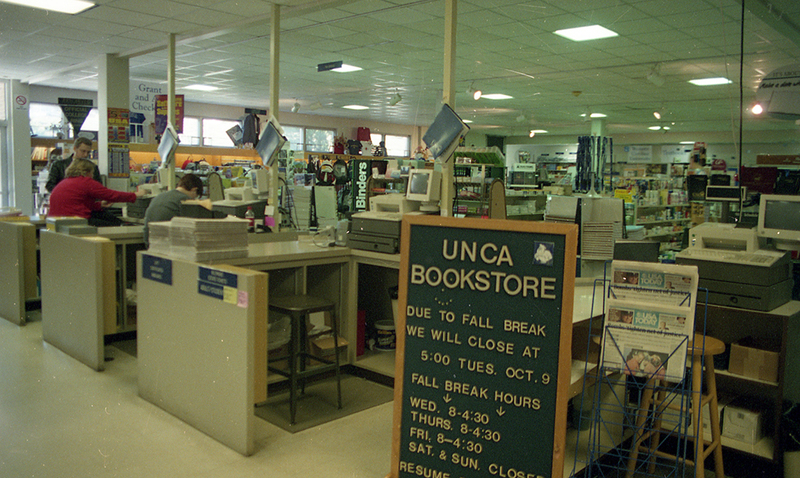 This was illustrated on October 16, 1997 when the Asheville Citizen-Times showed tarps being used in the bookstore to protect merchandise from rainwater dripping through a leaky roof. 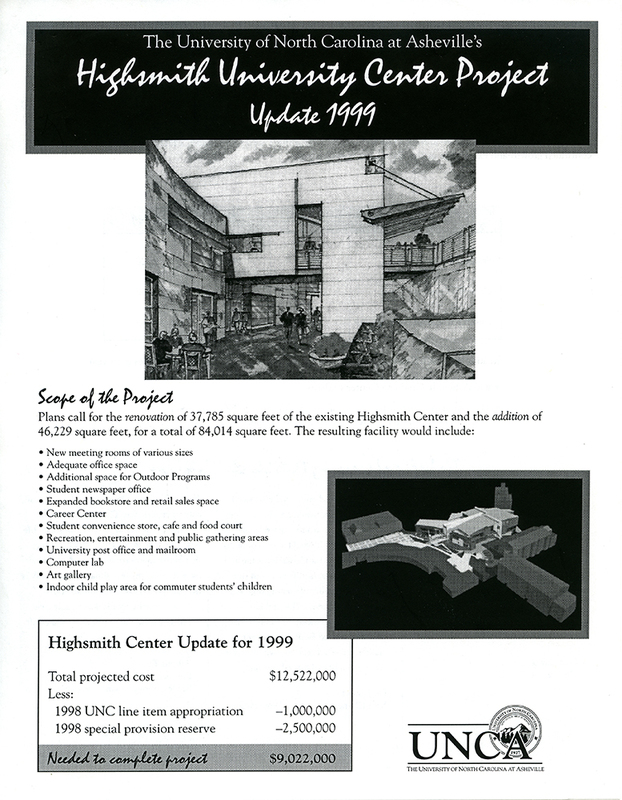 Despite such obvious problems, the 1997 Session of the NC General Assembly did not approve funding for work to Highsmith. However, the passage of the 2000 Higher Education Bond Referendum did allow the project to become a reality, with $11.5 million of the $15.5 million project cost being funded through Higher Education Bonds. Which brings us back to Operation Highsmith. But nothing is ever constant, and in spring 2017, renovations to the Highsmith Student Union began. These will provide meeting spaces and open areas for student organizations, provide areas for galleries, and a coffee shop. A large multi-purpose room between Highsmith and the adjacent Brown Hall will “bridge” the two buildings. Construction will continue through summer 2018. This time though it seems, no dogs will be lowered through the roof. The activities were organized through the freshman colloquium, and Sarah Bumgarner, who was then supervisor of the colloquium, came up with the name Bulldog Day. The Blue Banner subsequently reported that more than five hundred freshmen and first year students served at 27 sites in Buncombe County. 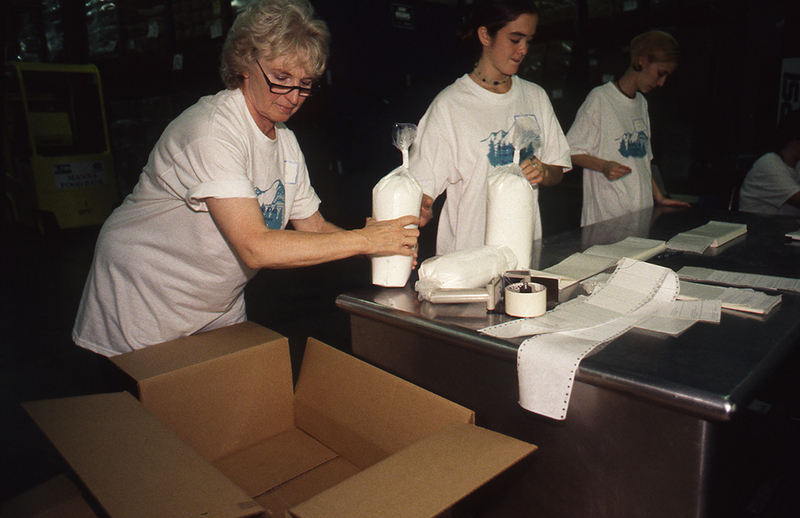 Activities that year included sorting and bagging food at Manna Food Bank, clearing trails, working with RiverLink to clean up the banks of the French Broad, and repairing a home for a Meals on Wheels recipient. The Asheville Citizen-Times wondered if the program “defied a popular myth that young college students are detached from the community around them”. 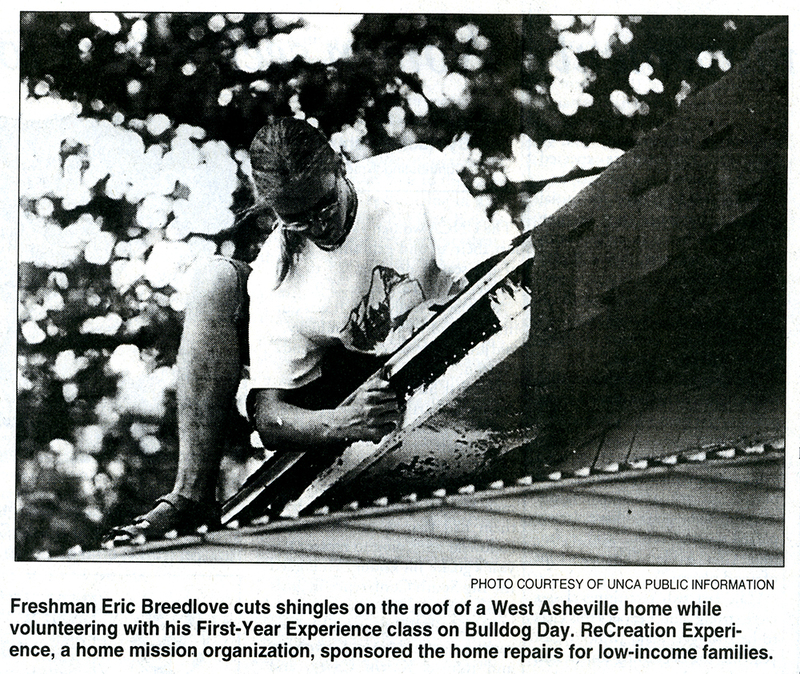 The newspaper also noted that community service had long been a requirement at private schools, and thought that UNC Asheville was part of a growing trend for similar initiatives at public universities. Chancellor Reed declared the initial Bulldog Day “a tremendous success,” and that it would be a focal point of orientation in 1998. That year’s projects included, clearing poison ivy from Kenilworth Cemetery, giving a party for children at Hillcrest HeadStart Center, assisting in the rehab of a former drug house, and helping to establish an urban garden. Additionally, students continued to work with agencies, such as RiverLink, Manna Food Bank, and Meals on Wheels who had been involved the previous year. Over the ensuing years, Bulldog Day continued and expanded, and not all service necessitated physical labor. For example, in 2000, students had breakfast with residents at the Vanderbilt Apartments, “followed by one-on-one, personal conversations and life story telling” that explored the generation gap between retirees and college students. One-on-one activities, along with group projects, were also held with students at four Asheville City Schools, where activities included photography, gardening, and reading. 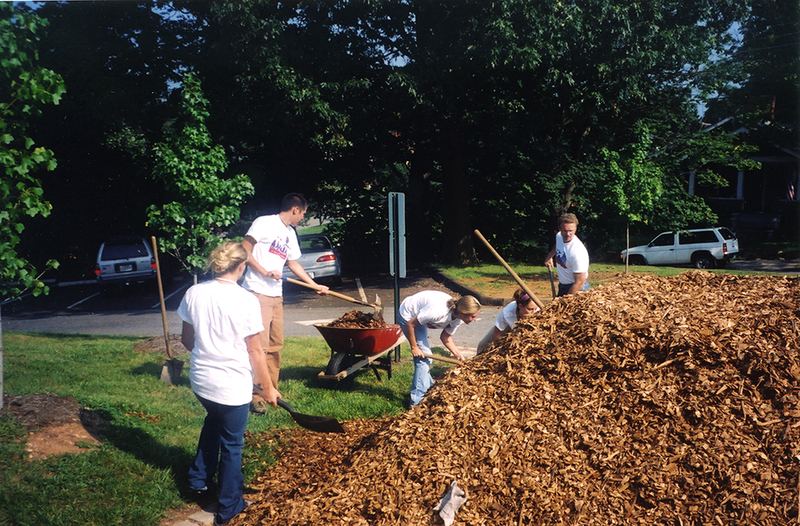 On Bulldog Day 2001, students worked at the YMI for the first time. They toured the facilities, and then created a mural in the auditorium from their impressions. 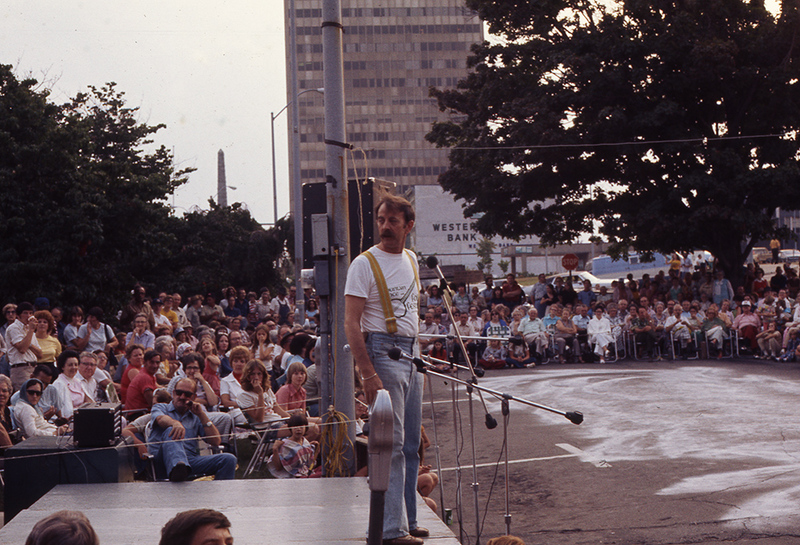 Merritt Moseley recalls that Bulldog Day lasted for about twelve years, before being revised, and renamed Act in Asheville Day, which was held on a Tuesday in early September. The program then involved one community partner for the whole freshman class, with the university partnering with organizations such as Asheville Parks and Recreation, and the Housing Authority. For a number of years Moseley served as Key Center Professor, and during that time took students to Atlanta to volunteer as part of the Martin Luther King Junior Jr. Service Summit. Martin Luther King Jr. Day is a still a day of service for UNC Asheville, with student and employee volunteers spending their day off engaging in service to the community. For the 2017 Martin Luther King Jr. Day of Service, UNC Asheville and Mission Health teamed up, with volunteers from the two institutions helping to, build homes, work with young people, older adults and family caregivers, care for rescued animals, clean up trash, and plant trees. Special thanks to Prof. Emeritus Merritt Moseley for contributing much appreciated information about Bulldog Day. A directive by Virginia Bryan for students in her literature class at Buncombe County Junior College to write their own philosophies in verse, prose, play, or editorial, resulted in two creations that are still evident at UNC Asheville today. The first was a Creative Writing course being added to the curriculum, the second was a literary magazine to publish the students’ work. 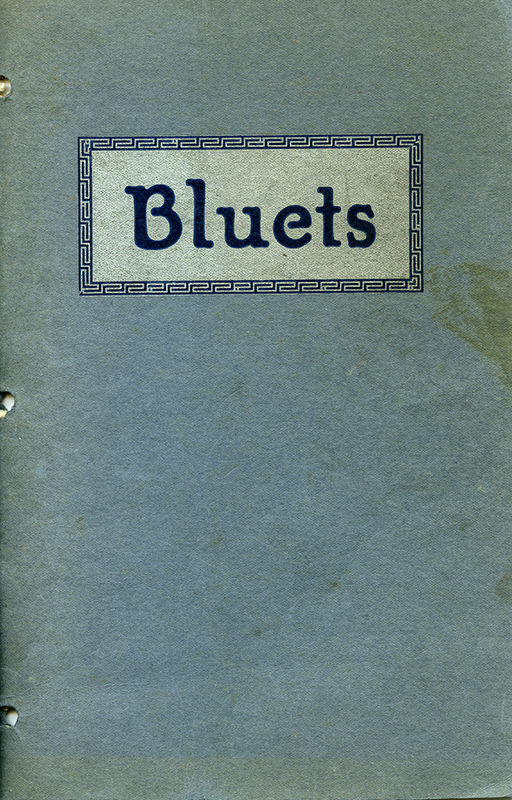 Bluets, was first published, we believe, in the spring of 1929, and initially contained mostly poetry. Indeed, its name, which had been chosen in a contest, came from a poem by John Charles McNeill, that was included on the flyleaf of early editions. 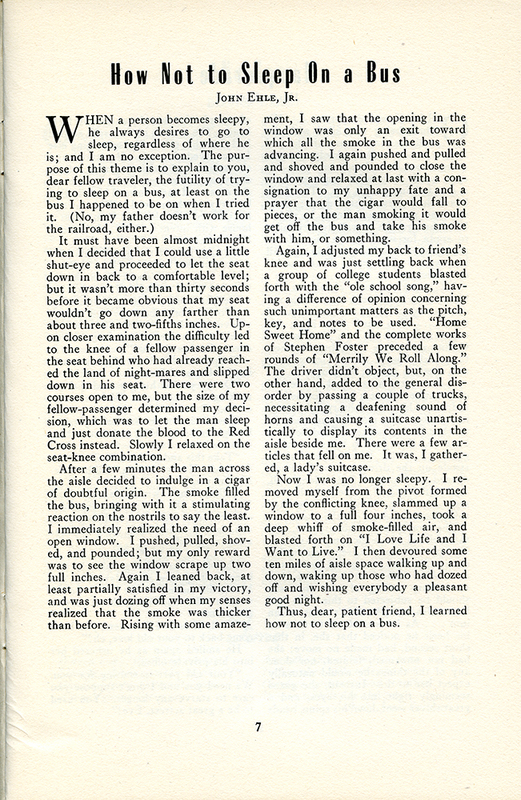 Writing in 1977, Virginia Bryan recalled how the first edition was produced with “much encouragement and no money,” and that students “secured a few ads to pay for early publications.” In the first edition, these ads were for a life insurance company, three cafes, a Chinese restaurant, and a shirt shop. The content soon expanded beyond poetry to include editorial comment, stories, book reviews, biographical sketches, articles about local places (e.g. Biltmore Estate, and Grove Park Inn), and interviews by the students with people such as Thomas Wolfe’s sister, and the wife of O. Henry. 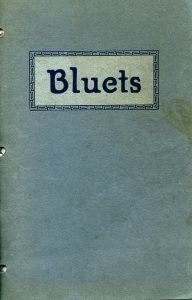 Although initially described as a “Literary Magazine”, in 1935, Bluets began to be described as, “A Literary Magazine Dedicated to the Expression of Progressive Undergraduate Opinion,” probably to reflect the expanded content. Until 1944, the cover art of each edition was different, with designs often being developed from ideas in the Creative Writing class. 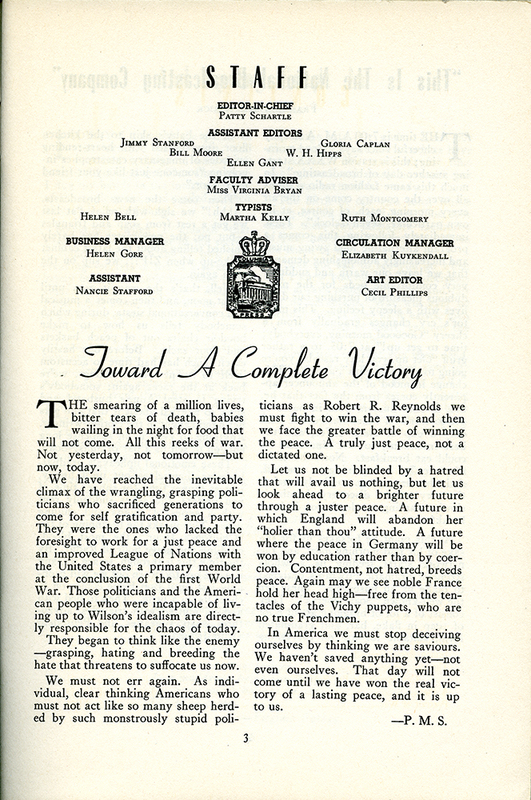 Editions published during World War II included tributes to students killed in action, and, not surprisingly, wartime articles generally took on a more somber tone. Any student at the college could submit work for inclusion, and the editorial board would decide which to accept or reject. Many of the students who had work published, would go on to make a name for themselves after leaving college, and not always in the field of literature. For example, the first edition of Bluets included work by Gordon Greenwood who, among many other civic contributions, served in the NC House and on the board of UNC Asheville. Another contributor was Dorothy Post, who provided works to the magazine and served as Associate Editor in the mid-1930s. She subsequently trained as a pilot and was a member of the Women Airforce Service Pilots during WWII. Post later wrote several books, and other Bluets literary alums include Gertrude Ramsey, who became society editor of the Asheville Citizen-Times, and writer John Ehle Jr., whose poetry and prose was published in Bluets in 1944. Ehle was awarded an honorary degree by UNC Asheville in 1987. Appropriately, that same year, Virginia Bryan Schreiber also received an honorary degree. Ten years later, in 1997, an honorary degree was awarded to, arguably, the locally best known Bluets author, Wilma Dykeman Stokely. 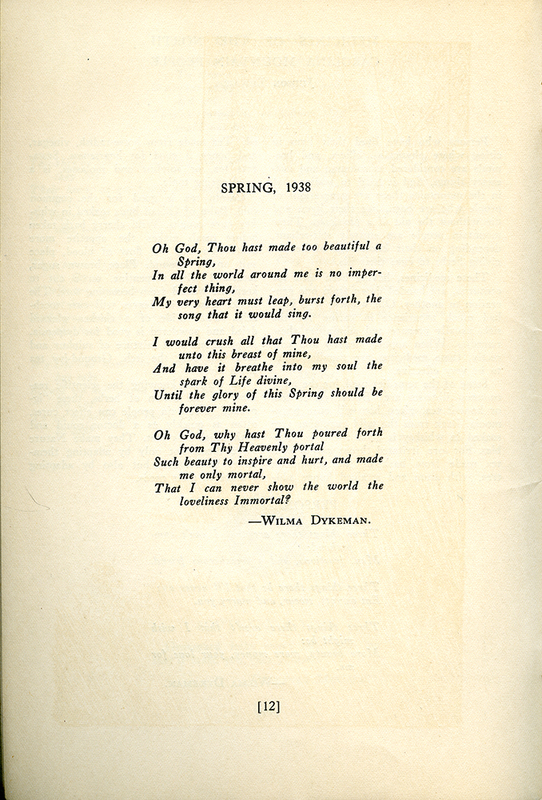 During 1937 and 1938, Wilma Dykeman wrote poetry and prose for Bluets, and served as co-editor. After graduating from Asheville-Biltmore College, she went on to write radio scripts, short stories, magazine articles, and books, including The French Broad and The Tall Woman. In 1985, she received the North Carolina Award for Literature, an award that, in 1972, had also been bestowed on John Ehle. With such talented contributors, it is no wonder that Bluets won many awards, including numerous first place certificates from the Columbia Scholastic Press Association. 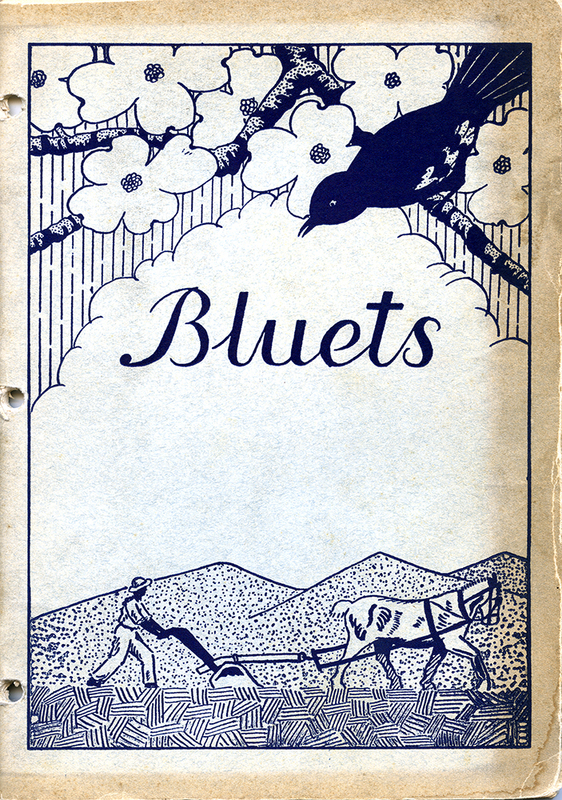 The last copy of Bluets in the archives is dated fall 1962. 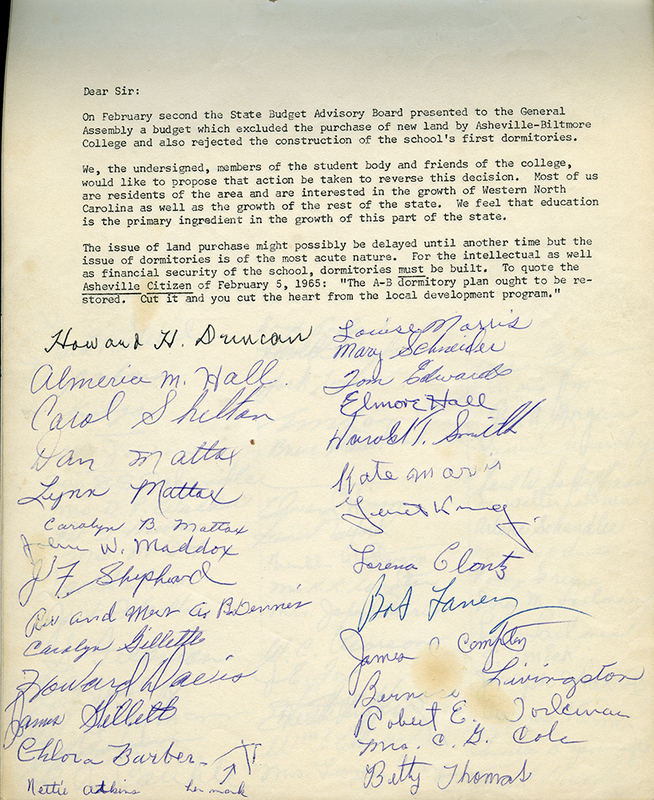 In The University of North Carolina at Asheville: The First Sixty Years, William Highsmith wrote that “the faculty had decided to discontinue [Bluets] because of its junior college overtones” and, “in May 1967, the first copy of Images was published.” The latter comment seems incorrect however, as there are materials in the archives that indicate Images was first published in the spring of 1964. Images was described as “The Fine Arts Magazine of Asheville-Biltmore College,” and combined artwork with poetry and short stories. It was published until the late 1970s, (The archives has copies up to 1977), before being followed by several short-lived publications, such as Fury, The Seventh Veil, and Alchemy of the Muse. Since the late 1990s, Headwaters has been the creative arts magazine of UNC Asheville, and it is published annually. Changing from a two-year to a four-year college, “on the basis that there was need for an institution in the mountains which would occupy a unique place in the state systems of higher education”. An institution “stressing quality, emphasizing independent responsibility on the part of students, and stimulating the creative energies of all through effective participation”, and which subsequently gained accreditation by the Southern Association of Colleges and Schools. Building “a maintenance building, physical education building, [which was about to be doubled in size], a student center, a library, a building for the humanities, and a dormitory village”. 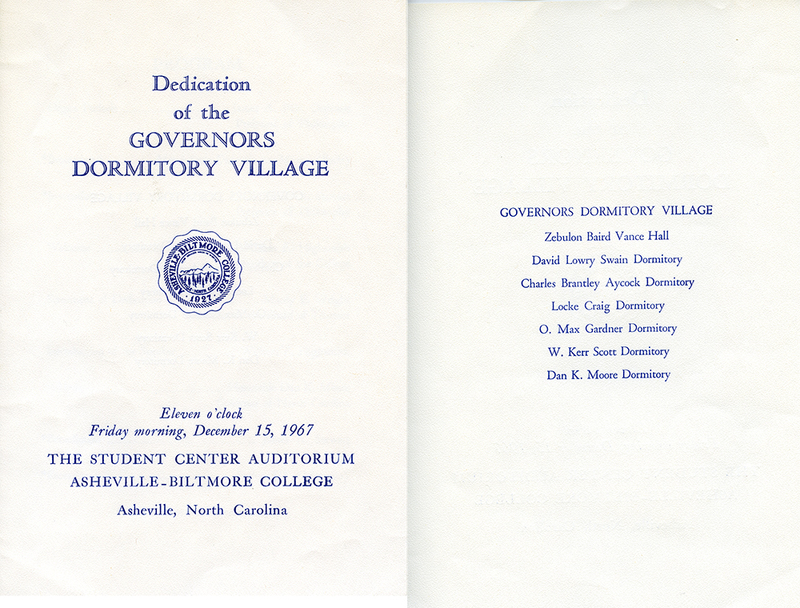 The “village” was Governors Dormitory Village which opened in August 1967 with seven buildings, each named for a governor who was either from Western North Carolina, or advanced higher education in the state. In The First Sixty Years Highsmith also wrote that on a cold night in early 1964, “a few of the hardier students erected tents on the quadrangle near the flagpole” and spent the night there, to call attention to the lack of dormitories. Of the seven buildings in the dormitory village, three were men’s halls, three, women’s halls, and one, served as Social Center and also housed a dispensary. Circa 1968, room rent was $85 per 10-week term, plus a $5 health fee, and a $7 linen fee. Draperies and a linen service were provided but “necessities”, to be provided by students, included blankets, hand towels, pillow, wash cloths, laundry bag and bedspread, the latter “preferably purchased after [the student was] in residence”. A typewriter, radio, record player, iron, shoe rack, alarm clock, ash trays, metal waste basket, and rug (2 x 4 washable) were all identified as “optional”. The rules for drinking alcohol in the dorms seem to have been different for each gender. An undated list of regulations for the men’s dorms listed six typed rules and two added in pencil. These restricted open carry outside dorms, drinking in the suite living room, and included a responsibility to keep the grounds clean, with possible suspension of drinking rights for infractions of the rules. Meanwhile, in May 1968, the women’s dorms held a secret ballot to see if beer and wine should be allowed in the dormitories at all. Thirty-three voted in favor, with twenty-two opposed, but the rules proposed for the women were much stringent than those imposed on the men. For example, women under the age of twenty-one were to get their parent’s permission to drink (the minimum legal age to drink was eighteen then), and when the student was “transporting her purchase from the parking lot to her dormitory, she must use the proper receptacle provided by the grocery store so that her purchase is at all times concealed and known only to herself.” Furtiveness was also inferred by other rules mandating that beer cans and/or wine bottles only be disposed of in the trash cans “at the bottom of the stairs in each dormitory,” and beer cans and/or wine bottles “could not be stored on the window sills in individual bedrooms”. Visiting hours were also different for the sexes. Although men and women could have visitors Friday evening until curfew, and also during set hours on Saturday and Sunday, the men were allowed additional visiting hours between 7pm and 10pm on Wednesdays. Why these extra hours were needed is not recorded. No other dorms appear have made a similar request. 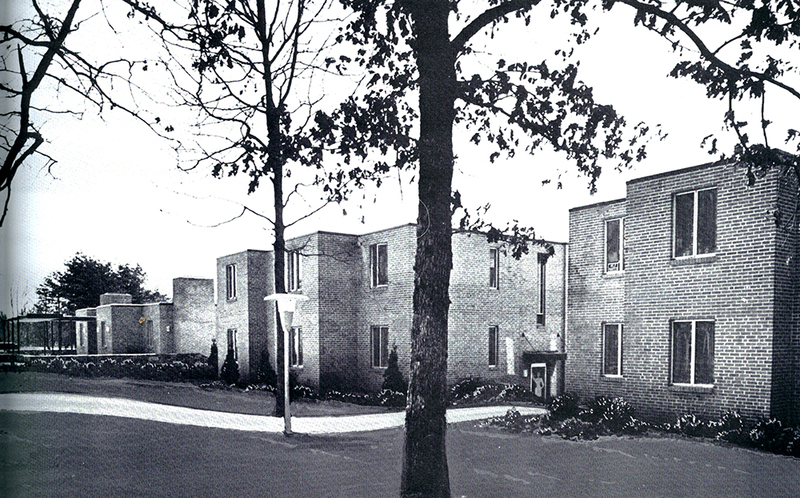 The dormitory options continued to expand, with two additional halls, Hoey and Ashe, being added to Governors Village in 1969, whilst Swain, Aycock and Craig Halls were torn down in 2002 to make way for Governors Hall. In 2011, the remaining five halls in Governors Village were renovated and, along with five other residence halls, they still provide accommodation for UNC Asheville students. 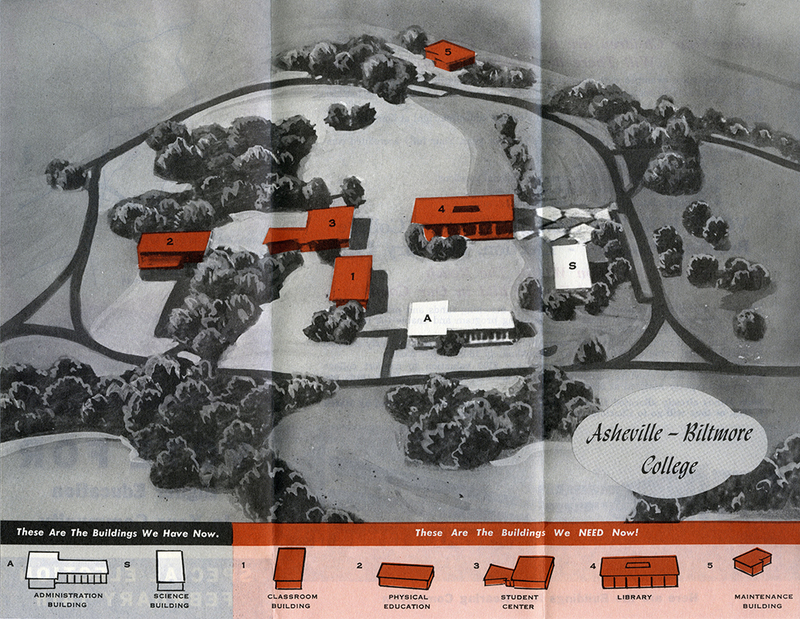 Fifty-six years ago, on the afternoon of October 8, 1961, Asheville-Biltmore College dedicated its new campus and buildings in North Asheville. 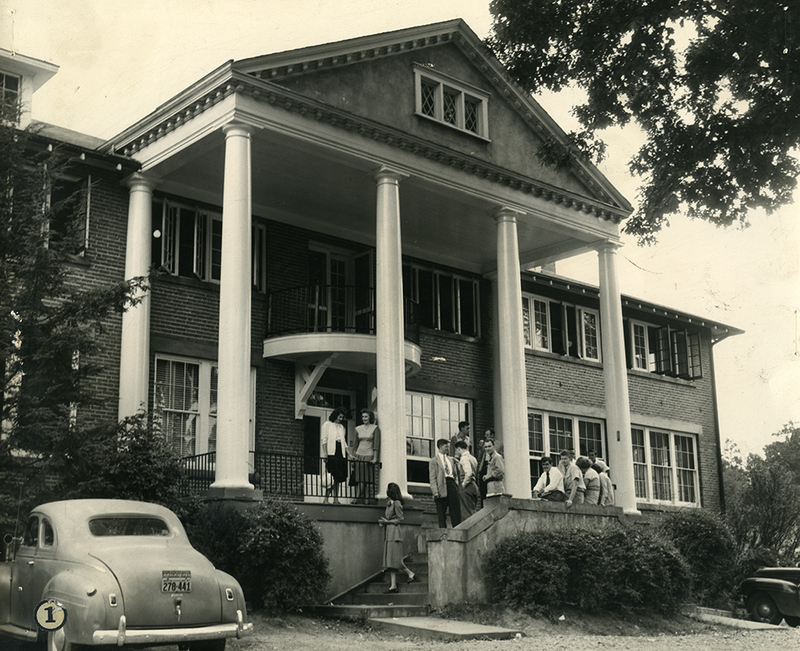 The plural of buildings was just about correct, as the college did comprise two buildings: The Administration Building (now Phillips Hall) which was also the temporary home of the library, and the Science Building (now part of Rhodes-Robinson Hall), with classrooms and laboratories. 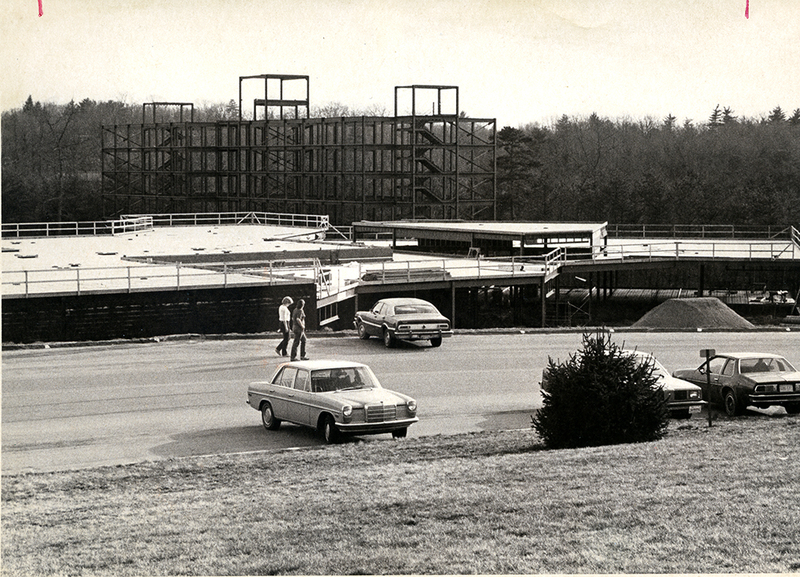 The purchase of the land for the new campus, and construction of the two buildings had been funded through a 1958 bond issue of $500,000, which had originally been intended to improve and expand the Sunset Mountain (Seely’s Castle) campus. 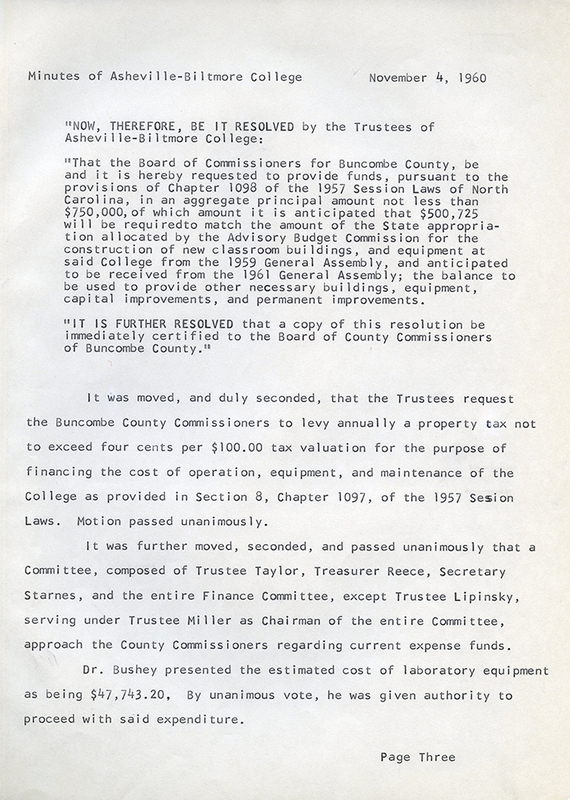 However, when the opportunity arose for the college to obtain land in North Asheville, the funds were used to move the college to its present location. 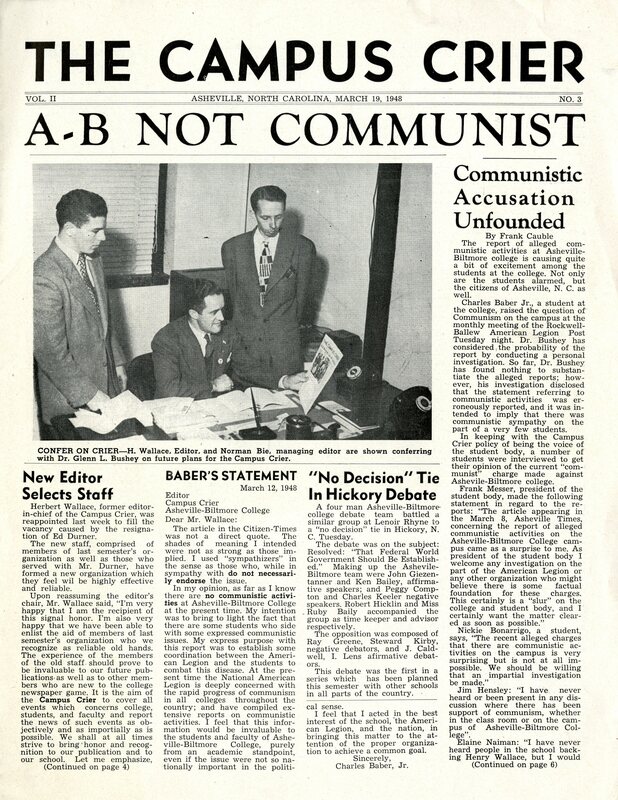 The 1958 bond issue had not been without some controversy. Although there was general support in favor of the bond issue, there was disapproval from some members of the African-American community. 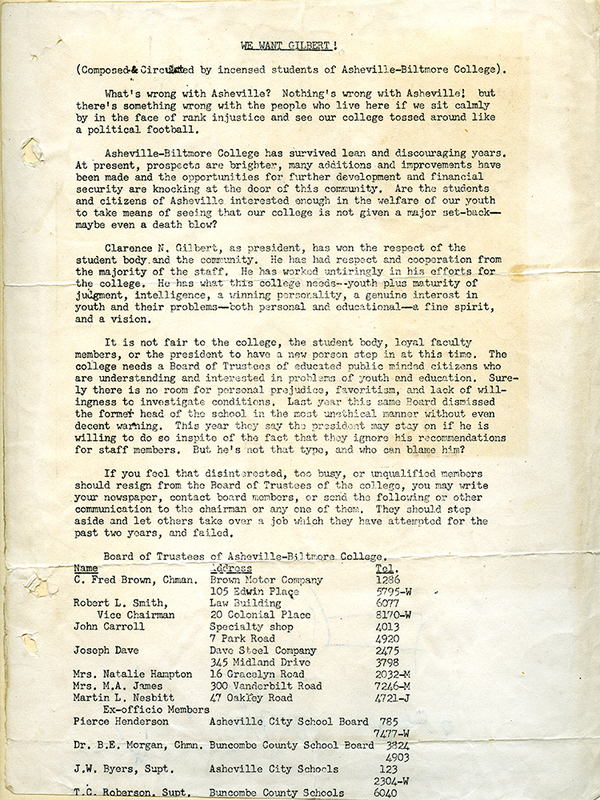 In 1958, Asheville-Biltmore was still an all-white college, and, when the trustees announced plans for the bond issue, they also revealed their intentions to continue segregation of the campus. This drew opposition from the Asheville branch of the NAACP, and the Asheville-Buncombe County Citizen’s Organization, who argued that “segregation is dead”, and consequently did not support the bond issue. However, despite this opposition, the bond issue won three-to-one approval, and even precincts with a high proportion of African-Americans voted in favor by substantial majorities. Clearly two buildings were not going to be sufficient for the college’s immediate needs, never mind any future growth, so, throughout 1960, the Board of Trustees reviewed plans for additional buildings, and how to pay for them. 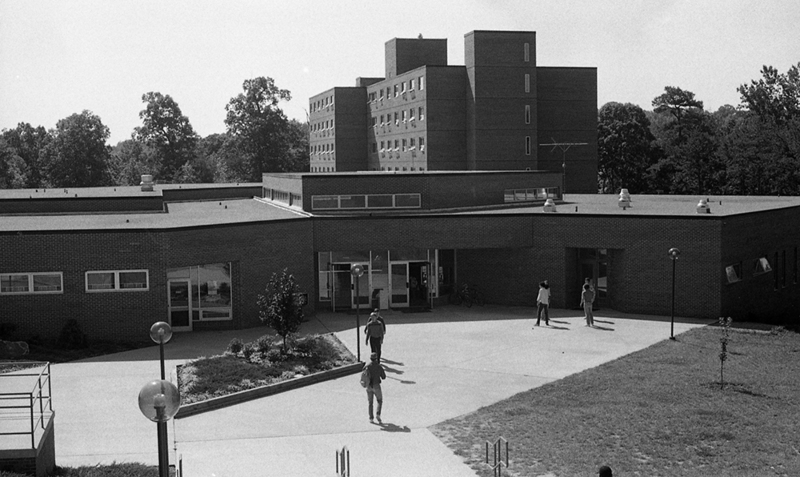 At the November 1960 trustees meeting, a resolution that funds be raised through a bond issued and a tax levy was approved, with the trustees stating, “the further progress, growth, and service of the College will be greatly hampered unless additional educational buildings are constructed and equipped”. 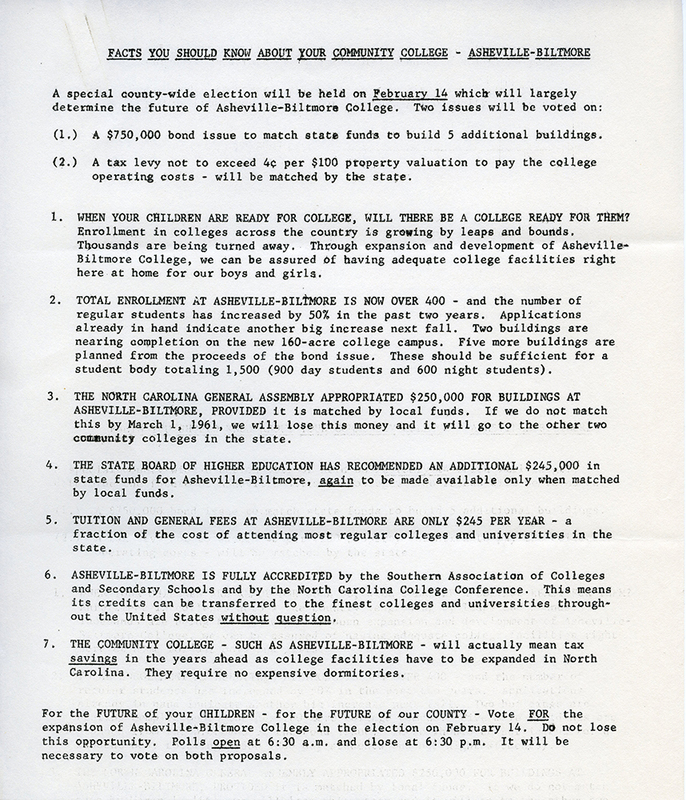 Campaign committees were organized in the city and county, and a speakers bureau created, with speakers appearing before civic organizations and PTAs to outline the need for additional funding, and the benefits that an expanded college would bring to Asheville and Buncombe County. Many letters supporting the bond issue were printed in the Asheville newspapers and, in an editorial, the Asheville Citizen supported the bond request “with confidence and enthusiasm”. Unlike 1958, there is no record of any opposition to the bond issue from the African-American community. 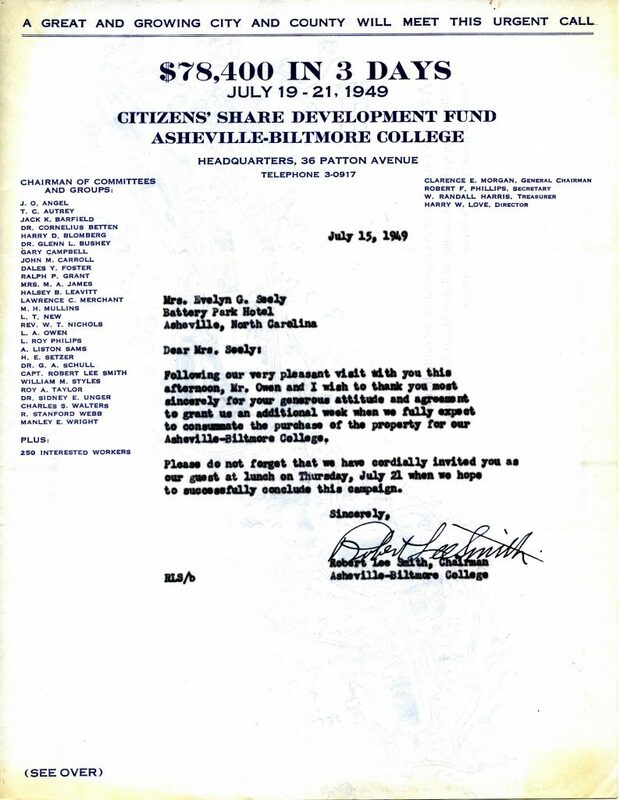 This may well have been because the college already had plans to integrate; the first two African-American students enrolled at Asheville-Biltmore in the fall of 1961, so it seems likely that this opportunity would have been known in February. A key part of the bond campaign was emphasizing the affordability of Asheville-Biltmore. Campaigners highlighted that tuition at the college cost $245 per year, compared to approximately $1,250 at Chapel Hill. Students and parents would be able to achieve this $1,000 saving for “just $4.16 extra per year”, that being the cost of the bond issue and 4% tax to a taxpayer. The other financial carrot (or possibly stick), was the $250,000 being offered by the state if Asheville-Biltmore could match that amount by March 1, 1961. If they didn’t, the state funds would go to either Charlotte or Wilmington College, or both. The campaign was a success, and the result was an overwhelming endorsement of Asheville-Biltmore. There were 7200 votes for the bond issue, and only 2713 against, whilst 6345 voted for the additional tax levy, with 2820 opposed. On the day after the vote, Asheville-Biltmore President Glenn Bushey wrote an editorial in which he described the vote as “giant step forward” for the citizens of Asheville and Buncombe County. He went on to say, “All too often, the Southeast is regarded as lagging behind other areas of the country in extending the benefits of education. It may be true that we cannot afford as much. But this vote has demonstrated that we do believe in education and will support it to the best of our ability”. 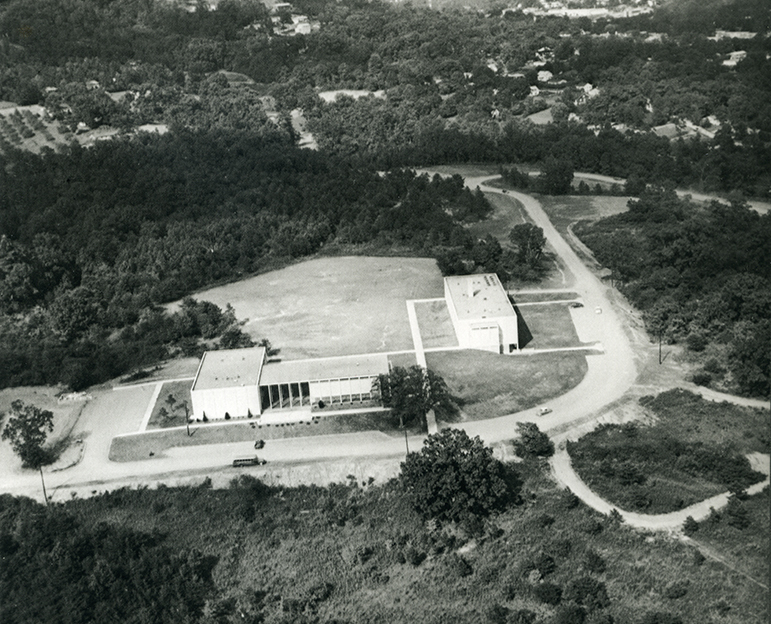 Within a few months of the October 1961 dedication, work was underway to construct the library, a maintenance building (since demolished), the student union building (now Lipinsky Hall), and physical education building (now the Justice Center). The campus was beginning to take shape. 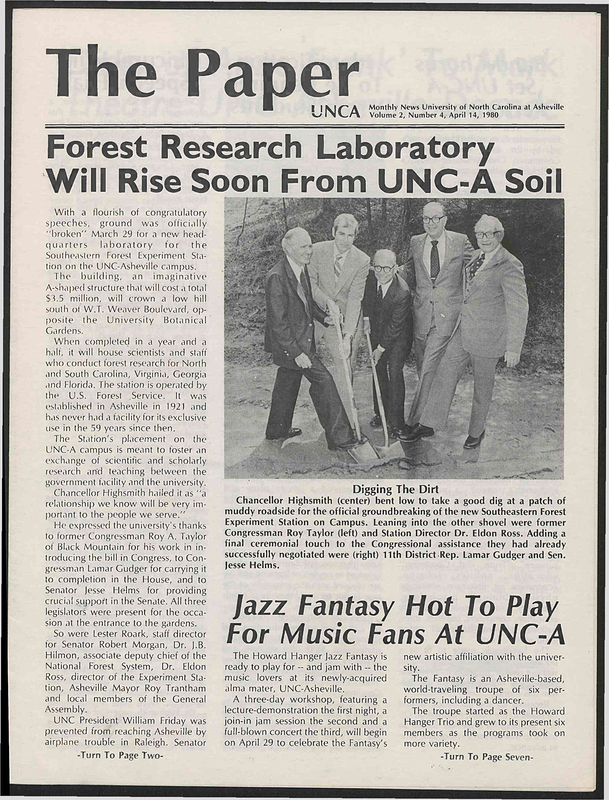 In October 1997, UNC Asheville celebrated its 70th anniversary with the first Founders Day, described by Founders Day committee chair Arnold Wengrow as, “a tribute to the pioneering students, staff and faculty of UNCA, and its predecessor institutions”. 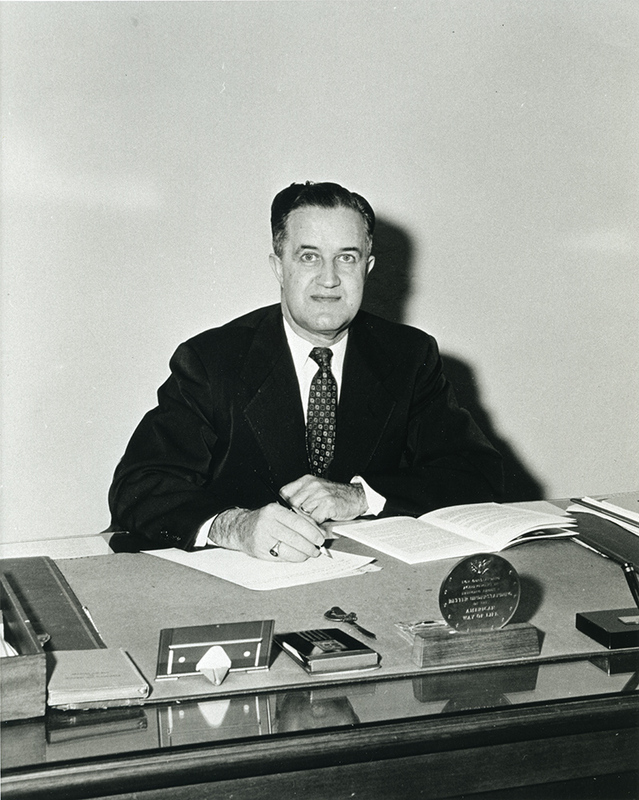 One pioneer that received special recognition on that first Founders Day was Glenn L. Bushey, president of Asheville-Biltmore College from 1947 to 1962. 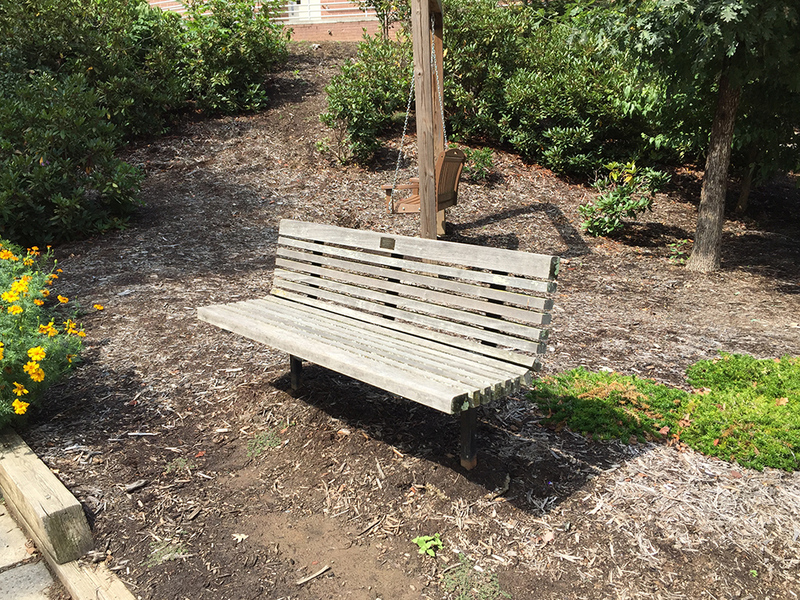 Dr. Bushey was honored by a bench and terrace area near Founders Hall being dedicated to him and, in January 1998, Bushey wrote to Chancellor Patsy Reed, thanking her for the honor bestowed upon him. His letter also included memories of his time in Asheville, and a description of Asheville-Biltmore College when he arrived in September 1947, to “face the greatest challenge of my professional career”. The challenge included: “securing a permanent campus for the college; improving the library and other academic facilities, especially laboratories; upgrading a dedicated faculty with emphasis on raising the percentage holding graduate degrees; revising the curriculum to more successfully meet the needs of undergraduates as well as the business and professional needs of the community; instituting more effective admissions and counseling programs; expanding the public relations activities; developing adequate financial resources including increased local support and securing state aid; and attaining regional accreditation”. Bushey described the task as “formidable”, which seems like an understatement, especially when you realize that the college was perennially in dire financial straits, and in 1947 was “receiving only about $5,000 from outside sources”. The previous blog mentioned how the lack of money created a mythology about the college, and Glenn Bushey echoed that, writing how “marvelous cooperation from…trustees, faculty, students, alumni, county and city officials, business and professional groups, the media, and the general public” ensured that “brighter days appeared” for the college. One innovation that helped improved the financial situation was the establishment of an evening college, which not only allowed the college to provide programs for many sections of the community, but was also a boon to WWII veterans wanting to take advantage of the GI Bill. 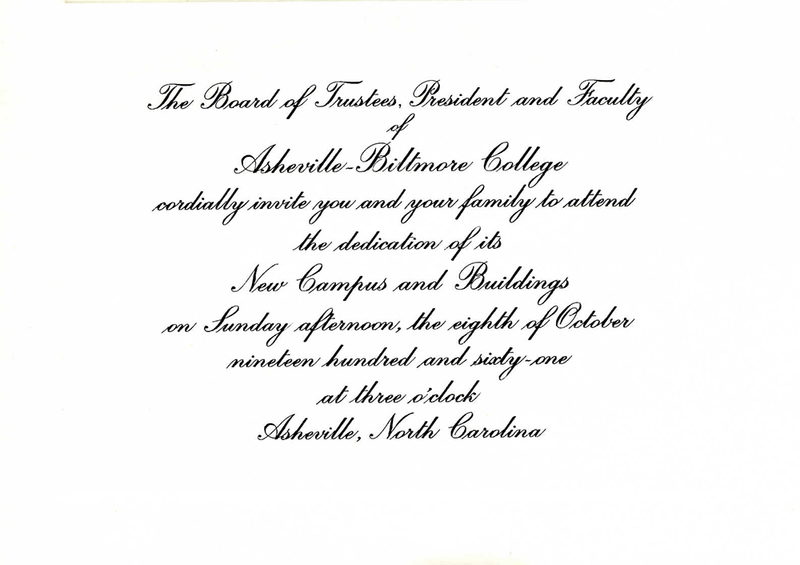 In a letter written in March 1998 to Tom Byers, then Special Assistant to the Chancellor, Dr. Bushey said that the evening classes put more emphasis on adult education, and that this was broadened by offering classes to benefit employees of specific firms, such as American Enka, Dave Steel, and the National Weather Records Center, as well as law enforcement officers of Asheville and Buncombe County. 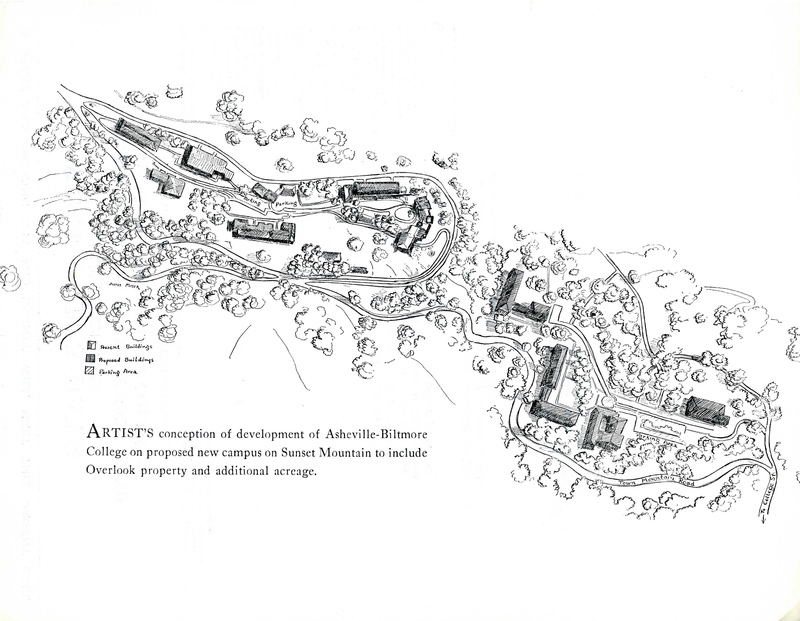 The first item on Bushey’s list of challenges, “Securing a permanent campus”, was achieved in 1949, when Asheville-Biltmore moved to Overlook (aka Seely’s) Castle on Sunset Mountain. Bushey recalled how, after initially securing larger gifts, the fund raising campaign then contacted the general public in a concentrated three day effort, with no gift being seen as too small. In his letter to Tom Byers, Bushey described the fund raising to purchase the castle as a “milestone”, and something that generated a feeling that Asheville-Biltmore was the community’s college. A strengthened academic program and a permanent home contributed to the college being able to attain regional accreditation, which further increased its base of support. Support that was was to prove important in subsequent bond campaigns by the college and, more importantly, in the attainment of 4-year college status and acceptance into the UNC system. In his letter to Chancellor Reed, Bushey wrote that his time at Asheville-Biltmore was “one of the most exciting a rewarding experiences of my life”, and acknowledged students, alumni, faculty and community members who “were almost like family”. Among those he identified for praise was A. C. Reynolds, “the founder of the college…an able administrator with remarkable vision”. He closed his letter by writing, “It is most gratifying to me to have lived long enough to witness a very small college which struggled for existence for more than twenty years after its founding develop into a great university. This I view of somewhat of an educational miracle”. 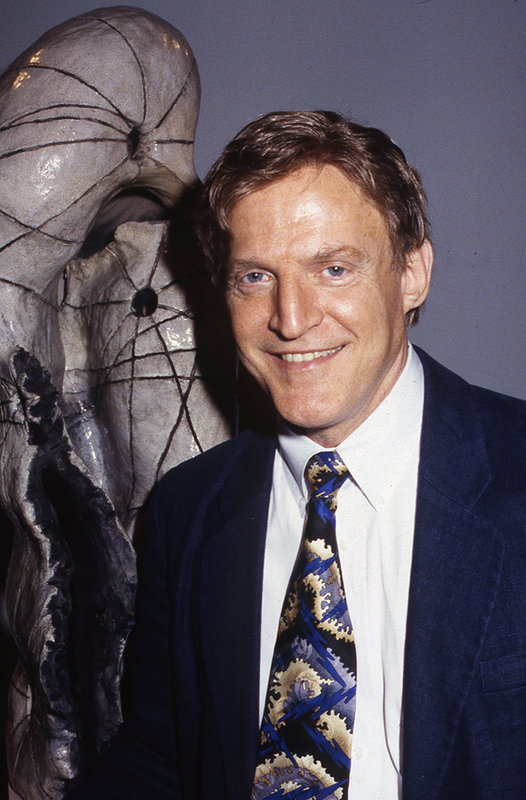 In 1998, UNC Asheville further recognized Glenn Bushey’s part in founding the “miracle” by awarding him an honorary doctor of humane letters. Dr. Bushey died in Chattanooga, TN on November 16, 2006. He was 101 years old. UNC Asheville can trace its roots back to 1927, and that same year, Joseph R. (“Joe”) Bly was born in Washington, DC. The Bly family subsequently moved to Asheville and, in 1945, Joe enrolled as a new student at Asheville-Biltmore College. He arrived as the recipient of the A C Reynolds Founders Award Scholarship which, as he recalled in a 1984 interview with former Chancellor Bill Highsmith, was worth $50, and for that he was expected to sweep the library, help paint the typing room, and haul cinders for the driveway! Bly had been class president at Haw Creek High School, and through this role had been identified for the scholarship by Mary Cordell Nesbitt. (Nesbitt was herself an alum of the college having graduated, as Mary Cordell, from Buncombe County Junior College in 1930. She would go on to serve in the NC House of Representatives.) 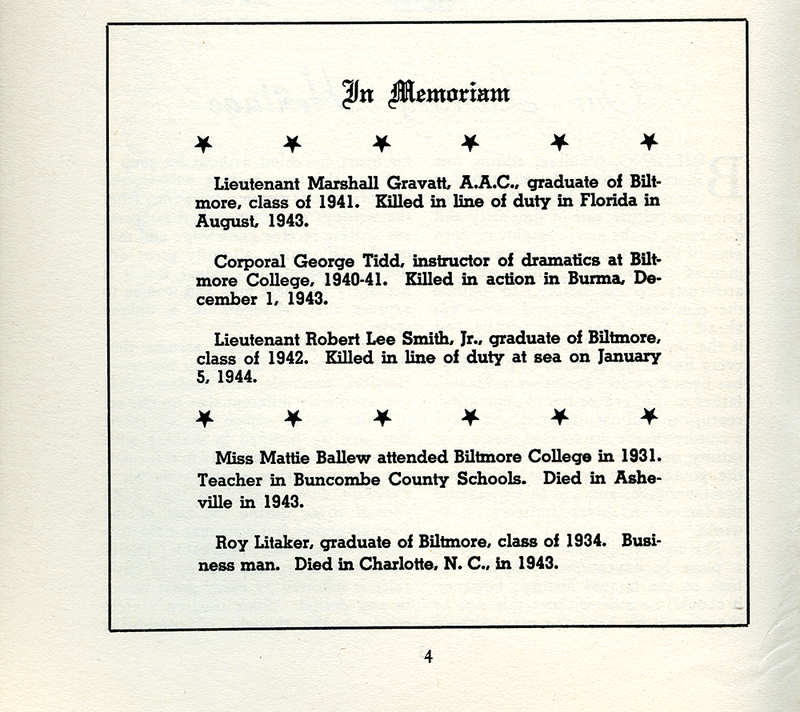 As he would later tell Highsmith, Bly’s family had little money, so the scholarship ensured that he could continue his education and he would not be “consigned to manual labor”. At the time Joe Bly enrolled, the college was located in a former children’s home on Merrimon Avenue, at the corner of Gracelyn Aveune, on the site of what is now Grace Covenant Presbyterian church, and was already well known in the local community. It had established a solid reputation for drama and for English (especially through Bluets, its award winning literary magazine), but as was the case for much of its life, the college was short of money. However, rather than seeing lack of money being a negative, Bly told Highsmith that it actually pulled the students together, and created what he described as a “mythology” about the college. 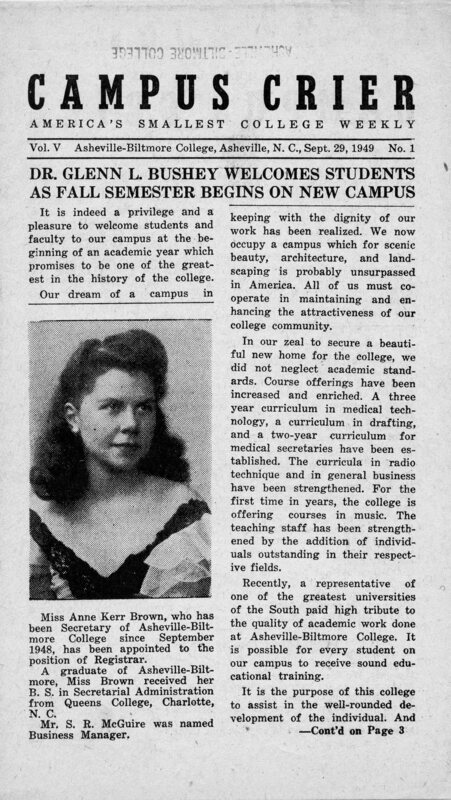 Around the time Bly started at Asheville-Biltmore, the college’s enrollment and, more importantly, its income were starting to be boosted by servicemen (and they were mainly men) returning from WWII. Many of the ex GI’s were part of a Refresher Class, “aimed at the student who had been out of college for quite some time…to prepare the student…for full admission to the Freshman class of college”. In his final year at Asheville-Biltmore, Joe Bly was president of the Student Council and, as such, was actively involved in events when President Clarence N. Gilbert suddenly left the college. Although Gilbert ostensibly resigned because the trustees had re-elected some faculty members without Gilbert’s recommendation, many thought he had been ousted because he was running against the chairman of the Board of Trustees in a City primary. Certainly the latter scenario is what the students thought, and they organized protests and published flyers in support of Gilbert. Bly was subsequently asked to meet trustee Martin Nesbitt in Pack Square, where Nesbitt requested that Bly “cool things down”. As Bly somewhat wryly noted to Bill Highsmith, it was probably not a coincidence that the trustee’s representative sent to influence Bly, was the husband of the person who was instrumental in obtaining the scholarship that had got him to Asheville-Biltmore. After graduating from Asheville-Biltmore in 1947, Joe Bly worked for the Post Office. By 1973 he was manager of manpower development for western North Carolina, responsible for developing a program for pre-supervisory training in postal management. For this he decided to take some classes at UNC Asheville, and he “got the student bug again”. 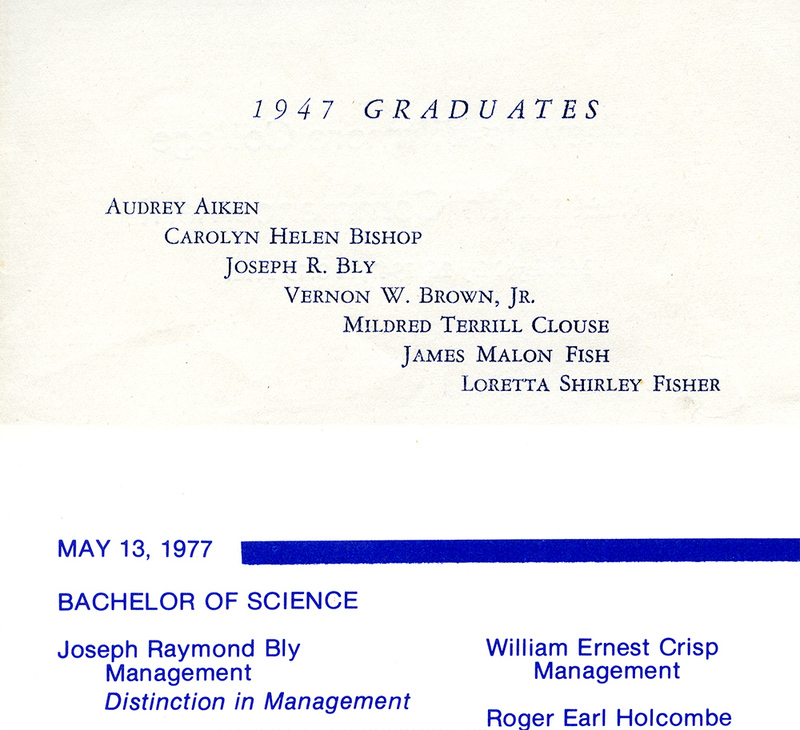 So although he initially only planned to take a few management classes to help his career, and set an example for postal employees, (“If they could go to school at night, I could go to school at night”), with no real intention to graduate, in May 1977 Joseph Raymond Bly did graduate from UNC Asheville with a BS and a Distinction in Management. After graduating (for the second time), Bly went on to manage the downtown post office in Asheville. Although this post is essentially about Joe Bly’s connection to UNC Asheville, it would be remiss not to briefly mention his other “careers”. For many years he was emcee for Asheville’s Mountain Dance and Folk Festival and Shindig on the Green, he was also manager of the Blue Ridge Mountain Dancers, and he was a long time ambassador for the arts, culture and music of North Carolina. Joe Bly died in April 2017. He was 89 years old.